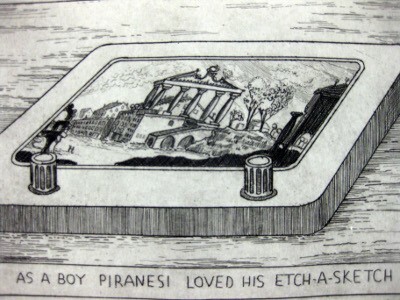 Maquoketa Art Experience presented over 70 of Arthur Geisert’s art history–related cartoon etchings, which were created for art calendars over the course of ten years. 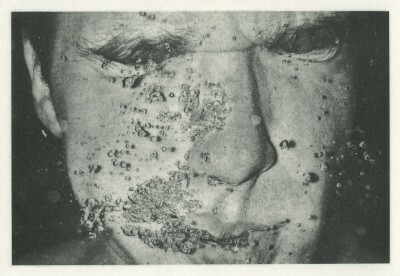 Geisert practices the 500-plus-year-old technique of copper plate etching. He is an artist and illustrator with many books in print in several languages. His publishing credits include Hogwash, Nursery Crimes, The Giant Ball and String, and Lights Out, many telling stories strictly through visuals. His works have been featured in national publications such as The New Yorker and have been on display in the Art Institute of Chicago, the National Museum of Art in Washington D.C. and the Figge Art Museum in Davenport, Iowa. Maquoketa Art Experience presented the work of Terry Rathje, artist and professor at Western Illinois University. Terry’s art covers a wide range, including sculptural assemblages of discarded objects, interactive installations, and digital images. Iowa artist, Brent Houzenga’s mixed media works are influenced by modern art, comic books, graffiti, and punk rock poster art. 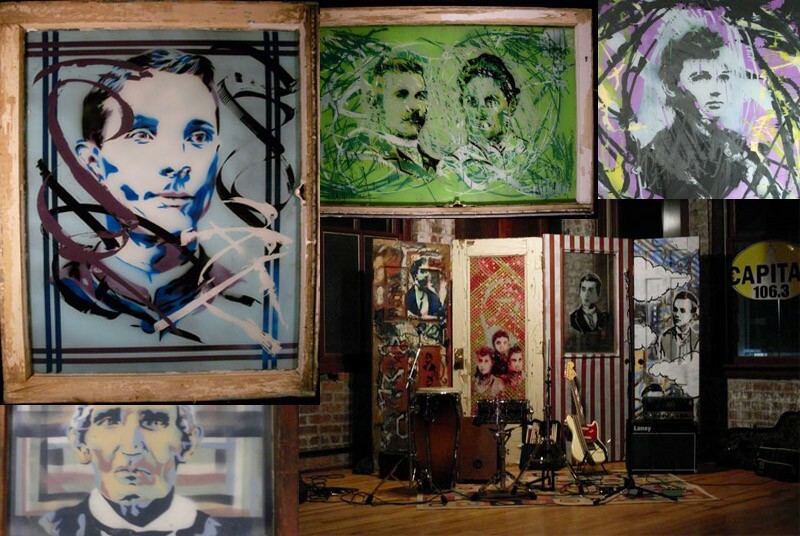 Houzenga’s work offers an eclectic mix of painting styles incorporating drips and graffiti with stencils on found objects including reclaimed windows, rustic frames, and antique photographs. The artist has exhibited throughout Iowa and across the U.S. including the Alcove Gallery in Atlanta, Georgia, The Hive Gallery in Los Angeles, and Art Whino Austin at Seventy-Seven Gallery in Austin, Texas. The exhibit also featured ongoing screenings of Hybrid Pioneer, a documentary film about Brent Houzenga and his work by Des Moines filmmaker Kristian Day. 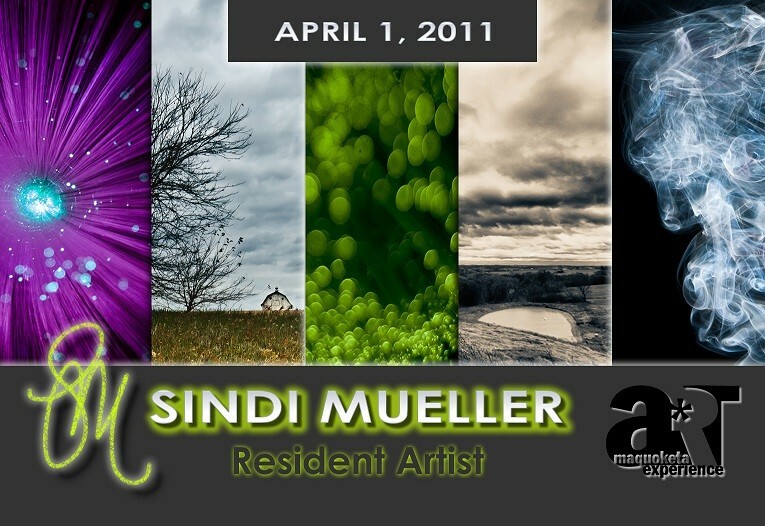 Maquoketa Art Experience welcomed Sindi Mueller with an opening reception on Friday, April 1, 2011. Sindi Mueller’s exhibition entitled Unveiling offers an exploration of kinetic photography and a study in rural and urban landscape photography. Sindi’s kinetic work—photography in which the camera is moved while the shutter is open—captures light, color, motion, and abstraction. Her landscape work explores color, shape, light, and texture of nature in her home state of Iowa, as well as the magnetism of the Chicago urban landscape. 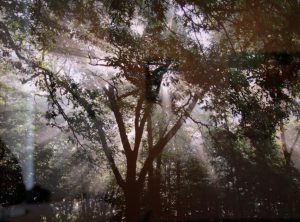 Sindi’s landscape images have been published in the Maquoketa Sentinel Press and Bellevue Herald Leader. Her first solo exhibit was held at Darkroom in Chicago entitled Seduced by the Darkness in December 2010. For this event, Maquoketa Art Experience artists/musicians/writers “and such” made interactive boxes with openings for guests to stick their heads inside or even crawl inside…a sort of haunted houses for your head in which the houses were filled with images, sounds, and words suitable to the season. Regional artists Mary Zeran and Dena Tollefson have created an exhibit that explores what it means to examine nature. Their paintings portray acts of exploration, seeing things in a new way. Although their methods and materials are different, the common link is their innovative approaches to leaving a mark on a surface. The marks are daubs of color and layers of drips. They combine these marks to create a bigger picture. Both artists are adventurers in color, exploring the palettes found in nature and imagination, delighting in combining the two to make something new and fresh. 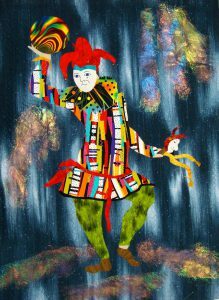 Maquoketa Art Experience welcomed Iowa artist, Stormy Mochal, for an exhibition of the original drawings from her recently published storybook, written by Jeanette Hopkins, entitled The Juggler. Stormy explored her native Iowa landscape for inspiration for the illustrations viewers see in the book. The Juggler’s pages are filled with the colorful, simple pleasures of starry skies, countrysides, farmhouses, and birds. Stormy Mochal earned her degree in painting from Loras College, has taught at Northeast Iowa Community College, and is the co-owner of Outside The Lines Art Gallery in Dubuque. 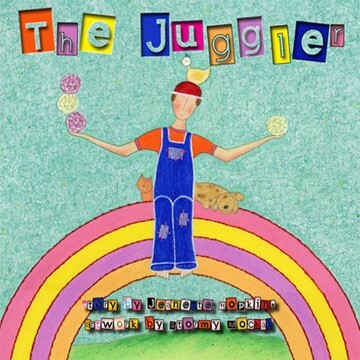 The Juggler, published by Ice Cube Press is her first children’s book. Exploring the idea of “place,” Zeran is fascinated with what it means to be a native Iowan. Seeing the landscape with fresh eyes after moving back to Iowa in 2005, her boldly colored abstract collage describes the movement, emotions, and rhythm of her native state. Evan grew up in Northeast Iowa and found a passion for art early in life. He divides his time between working on artistic projects and wandering the woods on his family’s property. 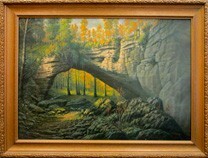 The landscapes in the area have been a major influence on his art. Even when focusing on the surreal, he applies certain elements of the region to his work. Evan commands a high level of skill in several media including oil painting, charcoal, digital artwork and sculpture. He graduated with his Bachelor of Fine Arts with an emphasis in painting in May of 2012. “One particular source of inspiration for my art is the idea that life is suffering. As I encounter such an idea through the works of philosopher Arthur Schopenhauer, who argued that every day of our lives is filled with pointless pain and suffering, I explore how such a gloomy outlook may alter the perception of one’s life. 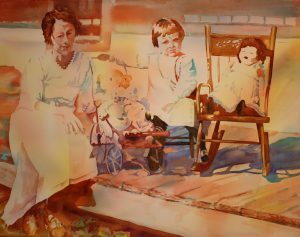 Through my paintings I capture subject matter representing significant moments in the stages of human life such as childhood, adulthood, and old age. These moments are expressed by subjects such as a baby carriage, a wedding portrait, and a wheelchair. I utilize oil on board in combination with my own photographical reference and a low key, desaturated color scheme to render each painting in a photorealistic manner. This photorealism forces the subject matter of my paintings into reality for the viewer, creating a more tangible experience which supports the possibility of truth behind Schopenhauer’s dreary philosophical ideas. “As I traveled around Europe in college, then around the world, and as I moved around the States through the eighties and nineties and traveled through the present, I’ve found that small sketchbooks can be employed in almost any situation. With a coffee habit developed in Rome, cafés became my favorite places for prolonged drawing sessions. I could discreetly sketch characters of interest or beauty. Or I could go inside myself for inspiration, inventing, designing, or imagining other worlds. The people around me in cafés and the conversations overheard often inspired images. My drawings and little watercolors could go beyond the autobiographical and become little portraits of strangers. Not necessarily likenesses of those around me, but reflections in style or in allegorical imagery. When I’m working alone, I tend to be self-expressive. In cafés, at bars, and at parties, I could expand into other points of view. 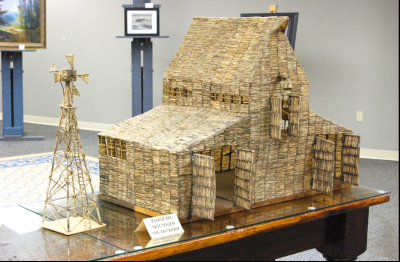 MAE hosted a special exhibition in honor of the Woodcarvers National Convention that took place in Maquoketa June 10 through June 17, 2012. Steve Kerper, a self-taught woodcarver, is from New Vienna, Iowa and has been carving wooden duck decoys since 1986. As an avid outdoorsman, sportsman, and hunter, the image of wildfowl were etched in his mind, so in an effort to supplement his income and fill his time, he began carving the decoys. He carves from many different types of wood, but his favorites are Walnut, Butternut, Catalpa, Sumac, Red Cedar, and Gray Elm. These woods are native to Iowa and grow on his land, so Steve cuts, dries, and cures the timber himself. Then he carves the ducks with a knife, sands them by hand, and adds 10 to 50 layers of tung oil to give them a shiny finish. Each decoy is unique. Steve most enjoys the challenge of carving distressed woods and those that contain knots. He also plants new trees in place of those he has cut to foster the environment. Since Steve began carving, word of mouth spread about his creations, and several news articles were written about his work. He has won many awards and sold his duck decoys in 48 states and 32 different countries. Additionally, Steve’s ducks were featured at the Smithsonian in Washington, D.C. in 1996 and 2001. 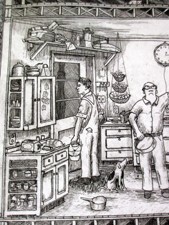 Arthur Geisert is an artist and illustrator from Bernard, Iowa who specializes in etching. This exhibit featured his children’s picture book titled, Thunderstorm. The illustrations are etchings created on copper plates using Dutch mordant as the acid. This technique dates back to 1500. Thunderstorm is a panorama, one continuous picture that depicts the sequence of a thunderstorm. 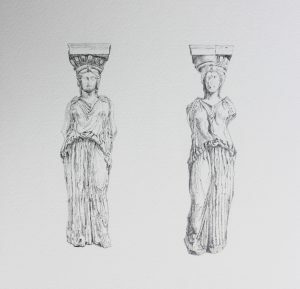 All together, the etchings measure 10 and 5/8 inches high and 40 feet and 1/4–inch long. The book was published in Spring 2013 by Enchanted Lion Books located in Brooklyn, New York. Arthur’s last book, Country Road ABC was published by Houghton Mifflin Harcourt. The illustrations were exhibited at the Figge Art Museum in Davenport. Previously, Arthur had solo exhibitions at the Art Institute of Chicago, the Cedar Rapids Museum of Art, and the Dubuque Museum of Art. He also has delivered lectures at the Smithsonian and the Universities of Illinois, Wisconsin, and Minnesota, to name only a few. Over the years, Arthur has published 23 books with 45 translations in Spanish, Japanese, Korean, Chinese, French, German, and Latin. Three of his books have been awarded the New York Times’ “Ten Best Illustrated Books of the Year”: Pigs from A to Z, Roman Numerals I to MM, and most recently, Ice in 2011. Arthur holds a Master’s degree from the University of California and an honorary Doctorate from Concordia University. This is Arthur’s second showing at MAE. In collaboration with the Jackson County Historical Society and Carson descendants, MAE exhibited 32 paintings by the late artist, William A. Carson (1867-1949). This exhibition was on display in our North gallery for approximately one month. We thank all those who were willing to temporarily lend their Carson artwork so that we could pay tribute to this renowned artist who once lived in Maquoketa. William A. Carson was born June 6, 1867 in Pennsylvania to Dr. James and Sarah Branigar Carson. The family later moved to Colorado where William spent a portion of his childhood. In Colorado, Carson played with Native Americans whom he treasured so much that he included them in many of his paintings. In 1879, the Carson family moved to Maquoketa, Iowa. Without ever receiving any formal training in the arts, William set up a studio here in Maquoketa on South Main Street and became well known for his artistic talents. In addition to Native American subjects, his body of works include landscapes, seascapes, portraits, historical paintings, religious paintings, and animals. Most of his paintings consist of oil on canvas, but he may have also used pastels and possibly painted oil on board as well. Eventually, William Carson moved to the Chicago area where he set up another studio and worked with Marshall Fields. Some evidence suggests that Carson employed a crew of approximately 25 female art students to help reproduce his paintings en masse, which he sold through Marshall Fields. It is believed that Carson traced each of his paintings and color-coded them for the women to paint the sections accordingly. In fact, some historians have argued that he may have been the father of Paint-by-Numbers. Carson was also employed by a lithographing publishing company in Chicago and became well traveled as he searched for subjects to include in calendar paintings. These calendars were distributed across the United States. Upon retirement, Carson lived in Park Ridge, Illinois and later moved to Los Angeles, California in 1942 with his wife, Ida French and son, Earl. Carson also had a daughter named Mildred. In 1947, he moved back to Illinois where he spent his last days and passed away in 1949 at the age of 82. Korey Schepers is a senior at Maquoketa High School and also takes college-credit classes through Clinton Community College. She is actively involved in the school where she participates in cross-country, tennis, soccer, softball, Student Senate, Art Club, and plays saxophone in the band. She is presently looking at colleges where she plans to pursue studies in art, graphic design, or biology with an emphasis in forensics. 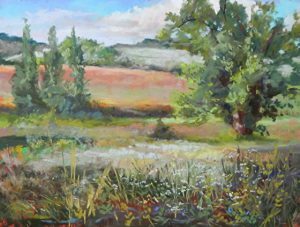 In October 2012, Korey enrolled in a two-day Fine Arts Workshop at Maquoketa Art Experience (MAE) where she studied under Denice Peters for two days, learning the ins and outs of pastel landscape painting. During this workshop, MAE discovered that Korey had only experimented with pastels three times prior. As we watched Korey master this medium painting after painting, we grew more and more impressed with her natural talent. Korey’s ease with grasping this new medium was the inspiration for MAE’s new Student Exhibition Gallery space. We wanted to honor Korey and share her art with everyone. Korey’s favorite medium is acrylic painting because it is forgiving; when she makes a mistake, it is easy to start over. In regards to subject matter, Korey likes to paint people and objects that possess interesting characteristics. To Korey, art is a creative outlet that inspires her, one in which she can escape and not worry about anything else. Marcia Wegman grew up in Columbus, Ohio but has lived most of her adult life in Iowa City, Iowa. She studied Graphic Design at Miami University and moved to Iowa City to earn her Master of Fine Arts degree in printmaking. For the past 35 years, she has studied art through classes and workshops and realized her passion to create in other media. She has worked with oil, watercolor, acrylic, papermaking, paper jewelry, and mixed media collage. Today, Marcia is most known for her pastel landscapes, an interest she began fostering in the 1990s and one she refers to as a “perfect” medium for her. 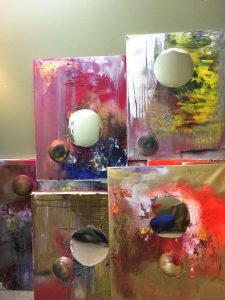 However, this medium has not kept her from continuing to cultivate her skills in other areas, which affords MAE the opportunity to showcase her abstract acrylic paintings. Several times a year, I put away my numerous boxes of pastels, clear off the studio table, bring all the various tubes and bottles of acrylic paint, a wide assortment of brushes and tools, various sizes of canvases up out of the basement, and spend several weeks immersed in abstract painting. This is an exciting switching of gears where I go from representational landscapes using my photo references to working entirely from my imagination and allowing the color, forms, and marks that I randomly apply to begin to guide the direction of the painting. I think of the pastel paintings as a very outward directed journey and the abstracts an inward and more spiritual journey. With the pastel landscapes, I have a concept in mind when I begin; with the abstracts it is all a surprise with the destination unknown and the journey itself as significant as the end result. The abstracts usually end up with some suggestion of a landscape, as nature is the underlying inspiration for both ways of painting. Images from left: Downtown Strut by Judy Thompson, Grandpa’s ’38 Chevy by Ken Harskamp, Rendezvous by Marvella Blome, Silversides by W.D. Lee, and Indian Creek Bridge by Karen Wolfe. 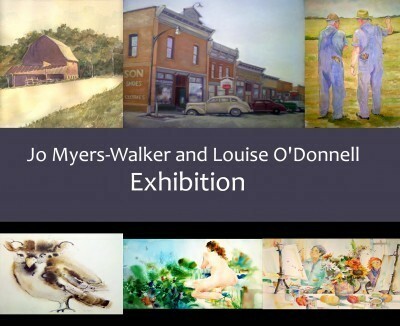 Upon judging of the Annual Iowa Watercolor Society Exhibition, this show travels to various galleries across the state. 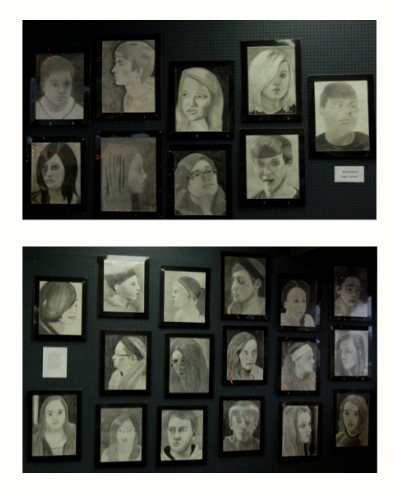 Maquoketa Art Experience was honored to be the second location to which the show traveled. 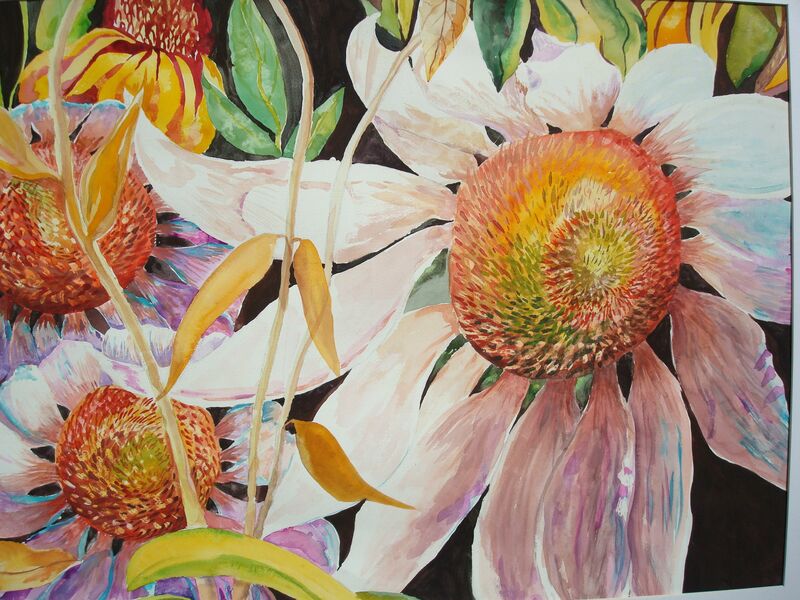 We exhibited 30 watercolor paintings, ten of which earned awards at the annual art show. 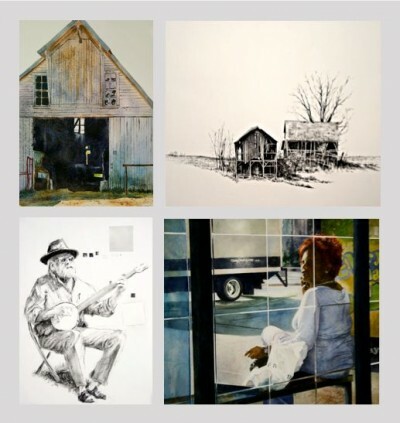 The Iowa Watercolor Society is an organization whose mission is to encourage and advance the medium of watercolor and display watercolor works by exceptional Iowa artists. Each September, the Iowa Watercolor Society has a juried art show. Though entries are open to all of its members, the show is competitive. Paul Jackson was the judge of the 2012 show, the 35th in its history. 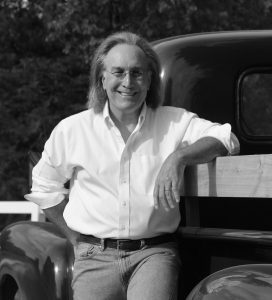 Jackson is an artist, author, and journal contributor and has also delivered presentations across the globe. MAE featured another one of our local high school artists. Jacob Koll is a senior at Maquoketa High School. He is also enrolled in concurrent classes at Clinton Community College’s Maquoketa Center. Jacob participates in baseball and soccer at the high school. Next year, he will pursue a Bachelor of Fine Arts degree in Film, Video, New Media, and Animation at the School of Art Institute of Chicago. Jacob distinctly remembers that his interest in art, as well as technology, began at the age of nine when he started playing the video game Halo and subsequently, began sketching in his own free time. Halo, through its innovative game play, continues to inspire him to think outside the box and see art without bounds. However, since then, he has grown as an artist and is also inspired through his Christian faith, which manifests itself in his work in a nuanced manner. Jacob never misses an opportunity to undertake any creative form. He draws, paints, takes photographs, and enjoys using technology programs, such as Photoshop for design purposes. He is willing and ready to explore all that the art world has to offer him. Jacob describes his creative process in the following way. “As I put my works into motion, they are sparked by a spontaneous thought that grows and evolves until I have a completed work of art.” He goes on to state that he notices dark undertones in his works, which are often balanced by an expression of empowerment. He attributes the dark undertones to traumatic childhood injuries and the notes of empowerment to his faith. 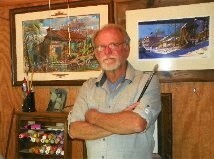 Tom Christopher is from Eldora, Iowa and is a member of the Pastel Society of America and the Pastel Society of Iowa. 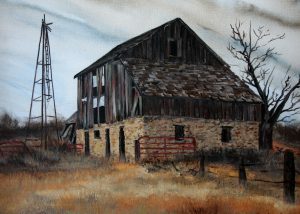 Tom’s paintings reflect Iowa, the place where he grew up and still calls home today. He relishes in taking ordinary landscapes—riverbanks, woods, and other scenes familiar to native Midwesterners—and painting them with a touch of flair. For more information about Tom and his work, visit his website. Isaac Biehl is a senior at Maquoketa High School, and he also takes classes through Clinton Community College. He has been active in school, participating in basketball, soccer, and football. He is also a member of Club hOpe, a student organization that seeks to make a difference in the world. He highly recommends that other students join this organization, attend different events, and get involved in different activities to make their high school experience more enjoyable. Upon graduation, Isaac will most likely finish his two-year degree while deciding on his major and other future plans. His choices of major include photography, creative writing, or liberal arts. He explains that he would “love to have photography” in his future career because he wants to do something he enjoys. Members of The Art Collective are committed to supporting the arts through affiliations with art leagues and educational organizations in our communities. Works cover a wide range of two-dimensional and three-dimensional fine art, ranging from realistic to impressionist, from serious to whimsical. 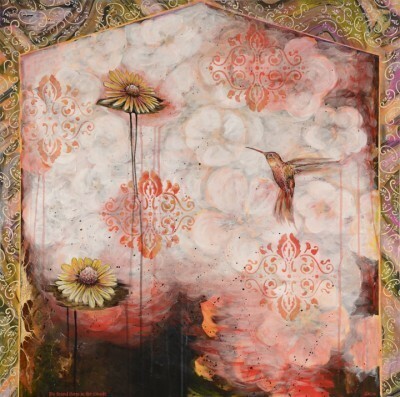 The themes and processes involved in producing work exhibited by The Art Collective reflect the diverse interests and styles of member artists. An element common to all the work exhibited is a high level of artistic talent and professionalism. To find out more about the individual artists, click on his/her name: Bill Wohlford, Amy Nielsen, Judy O. Gray. My artwork is about finding meaningful identity and individuality within popular culture. I strive to make energetic images that explore our relationships and interactions with what is precious, beautiful, necessary, serious, sensual, and non-sensical, through juxtapositions of disparate materials, clashing iconography, pungent color schemes, contrasting textures, scale, and simplicity versus clutter. My image-making process is fueled by curiosity regarding the process of partial cultural assimilation. These studio works are rooted in the quest for the individual within an apathetic culture of homogeneity, and pre-packaged identity. This search for individuality often turns into commentaries about how we miraculously form meaningful interpersonal connections and relationships while our souls seem to bob haplessly on an isolating sea of cultural white noise. With the visual feel of an erratic archeological dig into pop culture, these recent painted constructions are composites of several layers of imagery which reference accumulated cultural “deposits.” These “deposits” are rife with images and motifs “appropriated” from antiquity, sub-Saharan Africa, pre-Columbian cultures of Central and South America, as well as Folk artists, German Expressionists, old notebook doodles, and childish bathroom graffiti. All of which are contrasted with more prominent surface layers of machine gears, fast foods, cityscapes, “power” ties, and impulse buys. Maquoketa Art Experience is mad for Maquoketa’s Motor Madness (June 21-22, 2013)! 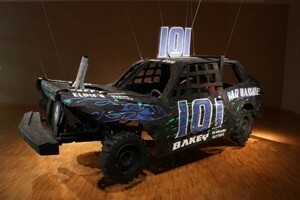 Jesse Bakey’s life-sized derby car is an installation you don’t want to miss! Jesse is a recent graduate of Clarke College. He specializes in large-scale cardboard constructions. His derby car is made purely from cardboard, but you will have to stop in and see it to believe it. We will also have some of Jesse’s smaller works on display including the car’s engine, another smaller car, and a hiker’s pack. I have grown up with demolition derbies. The cars coming out of our garage were always the sharpest cars on the track. My father and I have always taken pride in the sparkling dirtless cars as we pull out on to the track to become covered in mud and grease, and if we are lucky, we are the last to pull off the track in a mangled wreck of a car. When I first became interested in art, I never connected it to demolition derbies. Sure, a nice paint job, decals, and on occasion wax made these cars attract a lot of attention, but that’s where it ended. The typical redneck stereotypes didn’t help the matter either. My idea of what art is began to morph. Both art and demolition derbies have always been a release from the real world to me whether I was in the garage tearing apart a car or in the studio throwing on the wheel. Demolition derbies are seen as pure chaos; some refer to it as legalized road rage, others pure entertainment, and still others see it as both. Before the green drops, your heart nearly bursts from your chest. It’s when you hit that first car that you begin to slow down and think: planning your shots, how you can win, or how to get the biggest hit. During the event, the body blocks out the pain. You don’t feel the whiplash, the pain of your wrist in a spinning steering wheel, or the doorpost leaving paint marks on your helmet. It’s the adrenaline, and for me, it’s the same feeling I get from art whether it’s the feeling of accomplishment of creating a great work of art or the sick-to-the-stomach feel before an important review. I have created my current derby car in cardboard. I chose to use cardboard for a few reasons: it’s pliable, cheap, and easy to build large. The cardboard I use is recycled. Also, the cars I build are used, and when I am finished, I recycle as much of the car as I can. I have sculpted the pieces based off the condition the car was in after its second derby. The pieces created are all 1:1 scale. Other materials used are bolts, wood, glue, and paper. Often I notice people are surprised by two things about me. One, I am an artist, and two, I am a demolition derby driver. Taken separately, these may not cause surprise, but together, they can join two different worlds. I am a demolition derby driving artist. If I were to take one of these away, the other would suffer. The subject matter in Trúc’s paintings include landscape, bamboo, flowers, birds, and insects. In the years when she was living overseas with her family, she was inspired by the natural beauty of the landscape, the magnificent temples, the tranquility of mountains, and the murmuring streams that surrounded her in Sri Lanka, Sarawak and Penang of Malaysia. The variety of birds with their colors and the native flowers of four seasons give her the enthusiasm for painting. 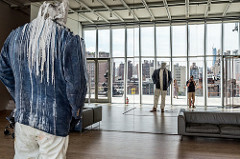 At each opening of her exhibitions, she usually gives an hour-long demonstration in the show room. On this occasion, viewers can observe the technique of how she uses her brush strokes with ink and watercolor on special paper for Chinese painting. Trúc has taught oriental brush painting in the United States, Malaysia and Sri Lanka. She has held a number of solo exhibitions and participated in numerous competitive and judged exhibitions as well. In 2001, the Iowa City Public Library selected one of her works for its permanent collection. In 2002, one of her paintings received an Honorable Mention Prize at the Hooverfest. In May 2012, Art at Mercy collected two of her pieces of artwork to include in their Mercy Hospital Art Collection. Furthermore, Trúc’s works have been purchased by art lovers around the world and are found in collections in Malaysia, Great Britain, France, Australia, Sri Lanka, the United States, and elsewhere. Many of Trúc’s works are being displayed at Melrose Meadow, a retirement community at 350 Dublin Drive, Iowa City, Iowa and at the office of Ms. Rechkemmer, 1106 Studio Arts, University of Iowa, 1375 Highway 1 W, Iowa City, Iowa. For further information, please contact the artist via phone at (319) 338-4369 or email ttdeegan@yahoo.com. In honor of this event, MAE hosted an exhibition of carvings by local and regional artists including Neil Cox, Rick Harney, Bob and Josh Guge, and Kirt Curtis and Linda Langenburg Curtis. Additionally, we hosted a reception for the Congress participants Thursday, June 13, 2013, 5:30-7:30pm. My art is a blend of many different creative expressions over many years. Working as a fashion advertising artist in Chicago, I started experimenting with different forms of art in my spare time. Because I enjoyed fashion and working with texture, weaving became my main interest. I created wearable art, which I sold directly to boutiques and through apparel marts in Dallas, Denver, Chicago and Hawaii. My interest in archeology and the art of early civilizations began to influence my art. I started weaving the Pre-Columbian symbols into my designs then painting those designs on silk, which I used in my handwoven fashions. Eventually, I discovered I enjoyed the painting process more than weaving. I continued to paint those ancient symbols but on canvas from there; it was a natural progression to paint and include the images of those ancient people and their modern descendants into my paintings. Currently, working in either oil or pastel, my interests include portraits, figurative art, murals and a series called Women Of The Americas. I feel I have combined and expanded on all my interests and as an artist, I am pleased with the result of this continous blending. A California native, Janet was raised in Chicago where she first attended the Chicago Art Institute at age 11 on a scholarship awarded to promising students enrolled in public school. After high school, she attened both the Art Institute and the American Academy of Art, both located in Chicago. She worked in advertising for many years and taught fashion illustration, design and figure drawing at Ray Vogue School of art (Ray College of Design and recently renamed again as Illinois Institute of Design). Currently, she lives in an 1842 Greek Revival home in the historic town of Galena, IL, where she keeps her studio in the old servants’ quarters. Her art has been shown in Southwest Art and Weavers Journal. Her creative experience includes teaching art classes and workshops around the United States and curating local art exhibits. She has led several student tours to England, France, and Italy. Collectors of her art can be found both here and abroad. The exhibition of “Messipi Threads” was a collaboration of over fifty artists in the Quad Cities of Iowa and Illinois. The show truly captured the art of quilting and the infinite application of fiber art. Visitors noticed the intricacies and versatility of needle and thread work, a compelling display of memories and moments, and a unique representation of how the Mississippi River threads through our lives. Messipi Threads is available for exhibition to museums, art galleries, libraries, special events, and public and private venues interested in showcasing fiber arts, the Mississippi River, or both. MAE is proud to be a host to this unique exhibition. The word “Messipi” is a French translation of the Algonquin/Ojibwa word “Misiziibi” or great river. Messipi was used from approximately 1666 until 1798 when Congress officially selected Mississippi. For more information about the Mississippi River Quilts Project, please contact Sara Detweiler at 309.235.3530 or sloughpump@icloud.com. You can also view the Messipi Threads Video, created by Vicki Todd with music by David G. Smith. To purchase your own copy, contact Sara Detweiler. “I never imagined the interest and impact this project could have!” declares Sara Detweiler, the project’s originator. 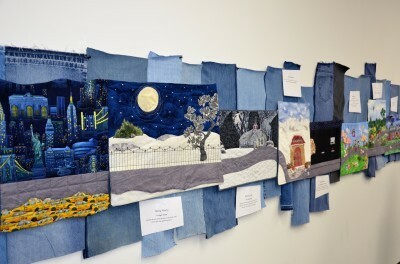 Sara began with the idea to have quilters share their memories of the Great Mississippi River. She found a fabric that resembled the muddy river. The directions were simple – create a quilt, 14 by 18 or 18 by 14 inches, and use the given fabric for the river, making it flow across your quilt. As the quilts came in, interest exploded! Sara bought more fabric. To date, over fifty quilters have contributed to this project, with more on the way. I’ve been an artist and art teacher for more than 35 years, working with people of all ages. Although I’m mostly into watercolors, I’m always exploring new techniques and materials. For me, the most joy of creating something is in the process of dreaming it up and figuring out how to actualize it. The recent sale of my studio building gives me the freedom to paint, live simply, go “on tour,” and be of service. I try to encourage others to have the courage to risk and live creatively. I returned to Iowa about 10 years ago after living in many places across the United States. The move has enriched my life and the major aspect of that enrichment is the pursuit of artistic expression. Combining that expression with the emotions I feel at being back home has been very rewarding. I initially worked in watercolor because its rendering of light appealed very much to me, and the feelings I had about what I was painting seemed to require that shadow and light. I paint a lot of subjects which are retrospective, scenes stolen from small brownie snapshots of life that call forth evocative feelings. Then I moved on to pastel, which appeals to me because of its vividness and the ability to get depth of nuanced color with layering. The brilliant color must be harnessed, versus watercolor where it must be pursued. I am most drawn to scenes of hot sun, cool shade – the feel of a Midwest summer day. My subject matter always comes from an intense emotional connection that I cultivate with the scene. I can’t paint if I don’t feel! Hence a lot of my work is personal in its aspect, but hopefully, it stirs the viewer to feel what I feel, most often a longing to be present in the moment portrayed. Lecture on cultural masks from around the world and how they have influenced his art to begin at 6pm. Upon graduation from St Cloud State University with degrees in art and music, Denny Vance took his first job directing band in Iowa. This was to be a temporary position while he pursued a Master’s Degree in art history and music education. Thirty-eight years later, Mr. Vance retired as a secondary school band director. Retirement then opened the door to Art in Fact Studio. 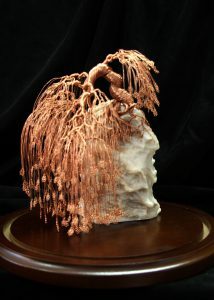 Denny has worked extensively in plaster armature and bronze casting. For the last twelve years, however, Denny has concentrated on wood carving. His style is strongly influenced by primitive cultures, especially Northwestern Native Americans, Oceania, Etruscan icons, and African cultural masks. His work varies from small sculptures and hanging pieces for the deck or indoors to life-sized lawn and garden pieces and much larger totem poles. Denny’s work has been shown in galleries or exhibitions in Olathe, KS, Hannibal, MO, Eau Claire, WI, and Cedar Rapids, IA, among others. Fiber artists were challenged with a small piece of “sidewalk” colored fabric and instructed to make the sidewalk appear on two opposite sides of the quilt. In this exhibition, all of the fiber artists offer their own interpretation of a scene from memory, imagination, or even what they see from a walk on the sidewalk. Look for the flowers, the children, and the red boots on the porch, a clothesline with wash drying on it, a church, and even a lizard. The artists, from Eastern Iowa and Western Illinois, have many surprises for you to discover. Come, see, and enjoy. Colleen Curry will display her fiber art quilts. Colleen has a Bachelor’s and Master’s degree in music education and performance. She started her quilting and fiber arts career in 1995. She served as quilt show chair for Mississippi Valley Quilters Guild for five years. Since the year 2000, she has shown her work in all of the Quad Cities’ major art venues. 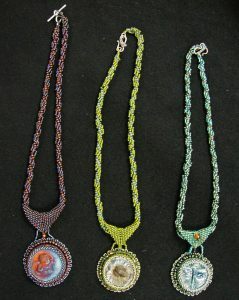 In 2002, she began teaching new fiber techniques, giving lectures and trunk shows of her work. In 2009, she formed the Quad Cities Fiber Arts group. This group meets once a month to show works of fiber art and to discuss new techniques. She is currently represented by The David Smith Studio and Gallery in Geneseo, IL. 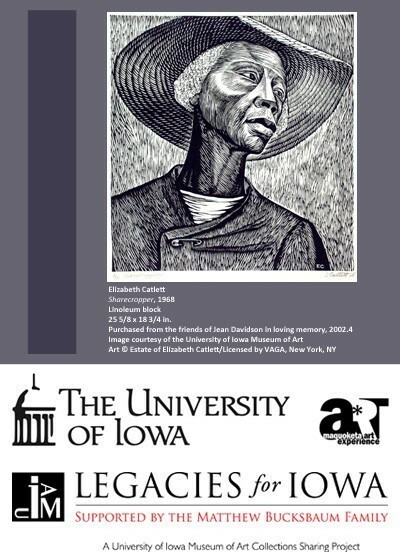 The Maquoketa Art Experience is pleased to present the exhibition I AM: Prints by Elizabeth Catlett, March 31 through May 30, 2014. Catlett was an American artist best known for the sculptures and prints she produced over the course of her career, from the 1940s into the 21st century. This exhibition is a pioneering collaboration with the University of Iowa Museum of Art and its Legacies for Iowa Collections Sharing Project, which is supported by the Matthew Bucksbaum family. Influenced by the realism of Iowa’s Grant Wood, Catlett (1915‒2012) sought to explore artistically the world she knew intimately—that of African American women and mothers. With Wood as her professor, Catlett was the first student to receive a Master of Fine Arts degree in sculpture from the University of Iowa (1940). She ultimately matured into one of the premier artists of our time. 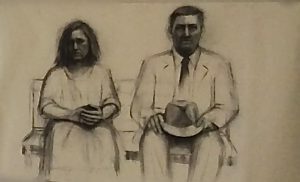 In her work, Catlett melded the approaches of American Regionalism and Social and Socialist Realism with the concepts and methods of approaches as diverse as Modernism, German Expressionism, Pre-Hispanic and African Art, to ultimately create an art inspired by her vision of the dignity and humanity of all people. She often included in her vision many of the leading figures of the Civil Rights movement and honored them in her work. In 1946, as a Julius Rosenwald Foundation Fellow, Elizabeth Catlett moved to Mexico City to make prints at Taller de Gráfica Popular (People’s Graphic Arts Workshop). 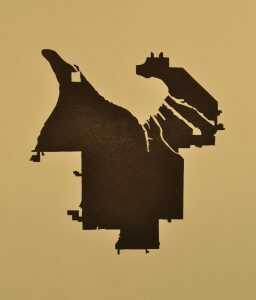 Sensitive to the many indignities and injustices which colonialism had subjected upon the indigenous Mexican people, Catlett championed the development of an emerging Mexican identity, accompanied by needed reforms in literacy and land tenure, in the linoleum block, woodcut, and lithograph prints she created with the TGP community of artists. The Maquoketa Art Experience is proud to display these works for the residents of Jackson County and surrounding communities. A reception for the Catlett exhibition will be held Sunday, April 6, from 2:00 until 4:00 p.m. Refreshments will be provided. 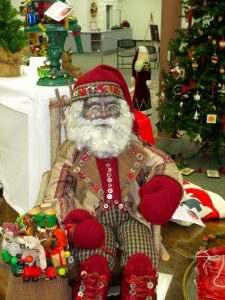 Carole Jean Boyd is known nationally for her Cypress Knee carvings, especially her Santa and Father Christmas. Her unique style, which draws from realism, primitive, folk art and caricature, defies categorization. It was her career as a photographic retouch artist that has been the single greatest influence on Carole Jean’s carving and painting techniques. She is the author of Carving Cypress Knees, an instructional book for woodcarvers. Carole Jean is Co-Owner of the Rumbling Water Studios and Gallery, in Wetumpka, Alabama. Detail that one word is the hallmark of each of Dylan Goodson’s woodcarvings, especially his relief landscapes, for which he is known in the woodcarving world. Always striving to portray subjects as realistically as possible, he uses a verity of techniques to create the perspective, depth and details that make his relief scenes unique. But Dylan’s talents don’t end with relief carving, his other favorite carving subject is the realistic human figure, the carving of which he has taken many classes to perfect, including spending two weeks at the Geisler-Moroder Woodcarving School in Austria. He has tried pretty much every genre of woodcarving at least once, but enjoys carving in relief and human figures the most and travels the country teaching these subjects. Dylan is Co-Owner of the Rumbling Water Studios and Gallery, in Wetumpka, Alabama. 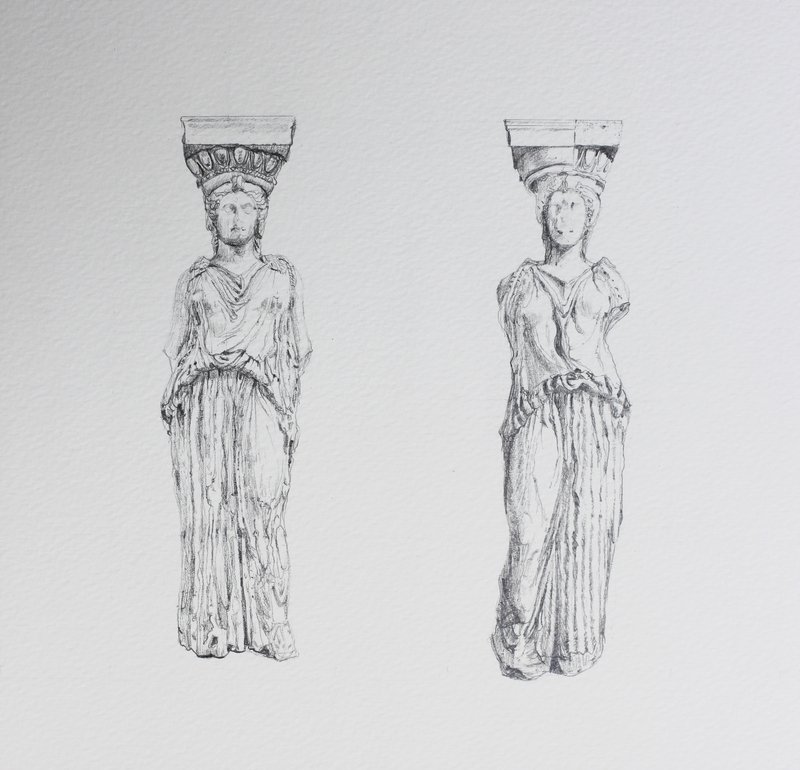 Debra enjoys working in the relief style of carving, drawing from a variety of subjects. Carving is a wonderful self expression and a never ending desire to learn and be inspired. The subject of her work varies, but favors those that evoke emotion. Debra lives in Lakeview Arkansas. Bill shows his work extensively around the United States. Recent exhibits include “Some Assembly Required: Collage & Assemblage” at the Cedar Rapids Museum of Art, “Our Earth” juried exhibit at Flow Art Space in St. Paul, MN, “The National Juried Exhibit” at the Bower Center for the Arts in Bedford, Va, and the “25th National Juried Competition” at Nicolet College in Rhinelander, WI. His work appeared in Studio Visit magazine in 2012 and 2013. He has also been published in International Contemporary Artists, Volume VII and International Contemporary Masters, Volume VIII in 2013 and 2014. Bill’s work is in the collections of the Cedar Rapids Museum of Art, the University of Iowa, and the Physicians’ Clinic of Iowa. Bill serves on the Visual Arts Commission for the City of Cedar Rapids and is on the Board of Directors of the Cedar Rapids Museum of Art. During the day, Bill’s job is being the Vice President of business development for Stamats Communications, Inc. Stamats Communications. This is a marketing firm specializing in the areas of higher education, healthcare, commercial building construction and maintenance, and professional meeting planning. Kelsey’s paintings reflect landscapes from different areas all over the world. Kelsey has taken many art classes throughout the past eight years and works mainly with acrylic paints. She has a detailed painting style and her artwork portrays realism. Kelsey takes painting requests and has a passion for helping others through the medium of art. Tom Christison is an enthusiastic printmaker who has spent many years studying and teaching printmaking, mainly lithography and monotype. He has taught printmaking and drawing classes or given print workshops at a number of institutions of higher learning including: McNeese State University, Ohio University, The University of Tennessee- Knoxville, The University of Iowa and most recently Coe College in Cedar Rapids, Iowa. 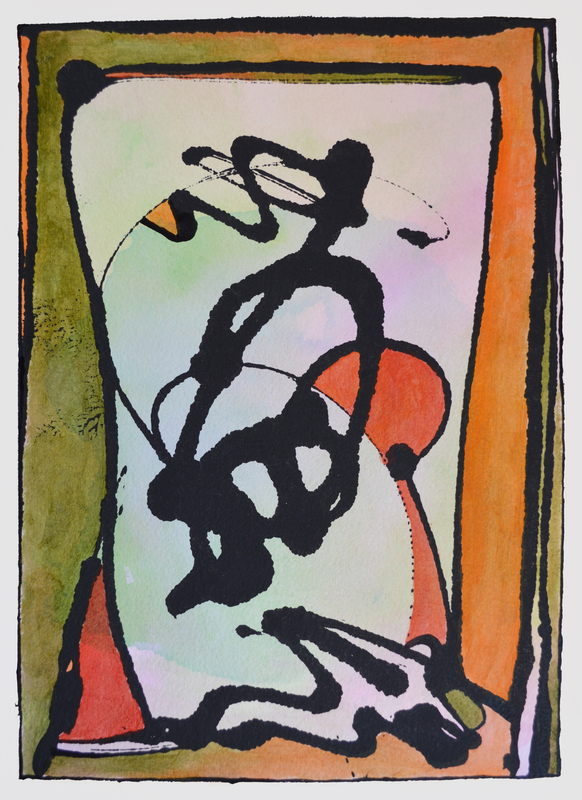 He maintains a private print workshop, Sandhill Press in Iowa City, Iowa where all of his investigations into printmaking take place. Christison’s recent works are print collages, layers of construction material, decayed to expose what appear to be previous generations of cultural decor or icon. Christison’s work is included in many prominent national and international collections. Josh Van Stippen grew up in Neenah, Wisconsin and currently lives in Iowa City, Iowa. He received his Masters of Fine Art in 2014 from the University Of Iowa in Dimensional Practice with an emphasis in ceramics. In 2009, he graduated from Edgewood College, Madison, Wisconsin double majoring in Art history and Studio Art. Josh attends workshops and residencies at the Anderson Ranch in Snowmass, Colorado and The Pottery Workshop In Jingdezhen, China. Josh has also conducted workshops at the Oneida Nation Arts Program. Nanoparticles are too small to be seen with the human eye, so my work Nanoscale brings nanoparticles to the human scale. The shapes of nanoparticles captured through microscopy imaging are appropriated in my specimens. The size of nanoparticles determines their properties and is critical to research and development of materials. Across many scales, my work explores the positioning and irregularity of nanoparticles and the unique functions that are achieved only on the nanoscale. Pastel demonstrations by John Evans and Tom Christopher during the reception. levels of experience who are interested in the pastel medium. 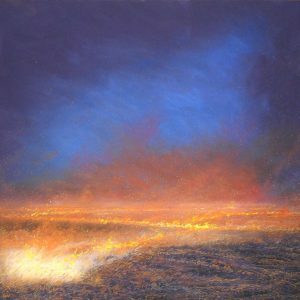 We bring together enthusiastic pastel artists as a group to network. We offer educational opportunities to assist our members in their artistic growth. We seek to create fellowship for the betterment of ourselves and our medium. Tom Hempel is one of the Quad Cities area’s most talented and creative watercolor artists. Tom has completed over 1,000 paintings depicting homes – new and old – schools, universities, public and private office buildings and churches. His work is widely distributed both in and outside the Quad Cities. Though well known for the work he has done to date, Tom has recently begun to expand his creative horizons by painting what he “sees” with his eyes and heart and not so much from photos he has taken. He is doing more “whimsical’ work, combining several different scenes to make a new scene. As a result, he has launched a new era of creativity. Add to his list of accomplishments a calendar underwritten by the City of Davenport Parks and Recreation Department. This calendar contains paintings of places and buildings in his beloved Quad Cities. 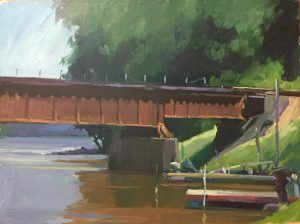 Tom’s paintings have been featured in local newspapers on both sides of the river and recently has had over forty of his paintings displayed in an exhibition at a new business in LeClaire which received high critical praise and led to several paintings being sold. Tom was born in Chicago but grew up in Bettendorf – in second grade his art interest was developed. He attended both public and private schools but it was in the 7th grade that he received his inspiration. He took an advanced art class at Bettendorf High School encouraged by his art teacher, Don Posten. And it was here with Don that Tom developed his interest in the medium of watercolors. He moved directly into advanced art classes through high school where he continued to be coached and encouraged by Mr. Posten after graduation. Though he received help and support, Tom was largely self taught during these early years of his career. Tom was drafted into the Army in 1966 and served two years, one in Vietnam. 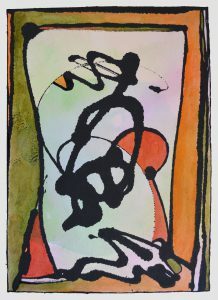 After his return in 1968 he continued his art training at Palmer Junior College in 1969 – 1970. In 1975 he married Marti Carstensen and it was Marti who rekindled his love of watercolors and asked him to paint a picture for her. Since they both shared a love and admiration of the old buildings in East Davenport Village, he painted a watercolor of Boyler’s Iron Works which was the first painting Tom sold. The rest is history. Tom’s artistic role models are Paul Norton, a local artist, and John Pike of New York. He continues to evolve in his art and his latest works are more vibrant and imaginative. I have enjoyed watching Tom enter into this new chapter in his painting career and look forward to more creative works. Tom and Marti currently live in Davenport and enjoy spending time with their daughters and sons-in- law and grandchildren. Tom can be contacted at his home at 563-355-8410. 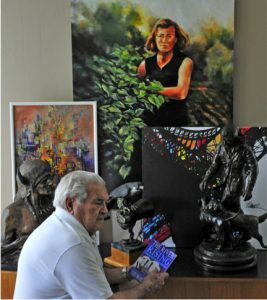 Reproductions of his art work are sold through several public and private outlets in the Quad Cities and regional sales outlets. I’ll have to start in Kindergarten…I can remember like it was yesterday. I was standing at my easel, and the teacher told me to paint something. So, I painted a two story red house with a tall chimney, a door and one window. Next, the large tree trunk and a big round ball of leaves at the top. Then I painted a large yellow sun in the corner with yellow rays beaming down. I think we all did that!! I am just an old fashioned watercolor artist who has been blessed to be able to sell my paintings. The greatest joy is that I am having more fun now than ever before. I wish I could say that my artwork has paid the bills and put food on our table, but I also retired after 30 years of working for J.I. Case in Bettendorf and Case-IH in E. Moline. Now, please join me on a trip through my ever changing artistic career. First things first, simple instructions on how to get started. I hope I can help with technical details to all the “wannabe” painters out there. I began doing my paintings by sitting at the location and painting “what I saw”. I remember one occasion while sitting in a driveway sketching a house and the husband came home and wanted to know why I was watching his house, he was NOT happy…. Another time one of the neighbors called the police and they came up to me with guns drawn wanting to know just what I was doing……As time passed, I decided it was better to paint from a photograph. I could stop time at the exact moment when all the right elements are there. As you will see, I am moving away from the “realistic” painting where my roots began. I always said “I can only paint what I see!” Now I am finding my true “artistic” talents. I am stepping outside the box of “realism” to a new world which I am still exploring. I find myself excited, which results in all night painting sessions. 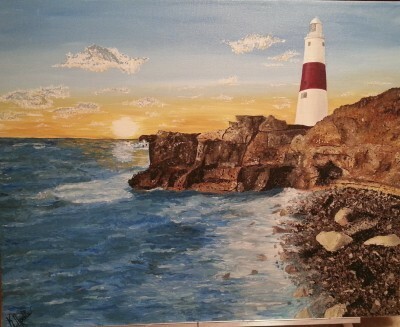 I have found that I can put elements of several photographs into one painting, what a rush!! Whoever said getting older meant you had to quit learning! 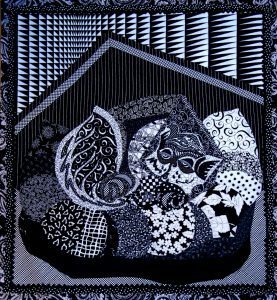 Zentangle is a popular art form and method created by Marie Thomas and Rick Roberts. The name is trademarked and the format is specifically defined. When this art form is used in any other format it is called a “Zentangle-inspired” creation and goes by several names: Zen Doodle, Doodle Art, and Tangles. Zen Doodle art is fun and easy to learn. It is often wrongfully referred to as doodling. Though there are some similarities, doodles are actually drawings done without full-attention while a person is otherwise occupied (often out of boredom). Zen Doodle is focused on creating pattern designs and mindfulness so that you do not think of anything else. The relaxed, meditative state created can relieve stress and lead to increased focus and productivity. The actual process involves dividing our paper into random sections with light pencil lines. This is called a “string”. Fill one section with a repetitive pattern that is called a “tangle”. As you fill each section the pencil lines disappear in the pattern. Many of the patterns used have ancient origins but our creative composition will make each piece unique. Patterns can be found all around us, in nature and our environment, or can be found in books, on the internet, or can be original designs of our own. The worldwide attraction of this art form is easy to understand. The tools are simple and portable – a pencil, a pen, and paper. There is no right or wrong. No mistakes – only opportunities. As you will see, I am moving away from the “realistic” painting where my roots began. I always said “I can only paint what I see!” Now I am finding my true “artistic” talents. I am stepping outside the box of “realism” to a new world which I am still exploring. I find myself excited, which results in all night painting sessions. I have found that I can put elements of several photographs into one painting, what a rush!! Whoever said getting older meant you had to stop learning!! Rosalie’s subjects are realistic, whimsical, and challenging. Her work reflects pictorial images inspired by family and nature. She offers a mixture of original design along with traditional quilt blocks. She uses a variety of techniques to achieve the desired results. Rosalie Baker began quilting in 1993, after retiring from a career as a commercial artist. 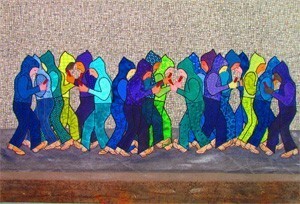 She has applied her artist training to the fabrication and designing of pictorial quilts. Her pictorial quilts range from small wall hangings to queen size. The Featured Quilter at the Cable Car Quilters Guild “Colors in Motion” quilt show in Dubuque, Iowa on April 22 & 23, 2006. The Featured Quilter at the Mississippi Valley Quilter’s Guild quilt show in Davenport, Iowa on September 24 & 25, 2010. The quilt “American Blood Brothers” was exhibited at the Museum of the American Quilter’s Society (MAQS) in Paducah, KY as part of the “Stitches From the Upper Midwest: Quilts from Iowa, Michigan, Minnesota and Wisconsin” from January 24 – March 24, 2007. 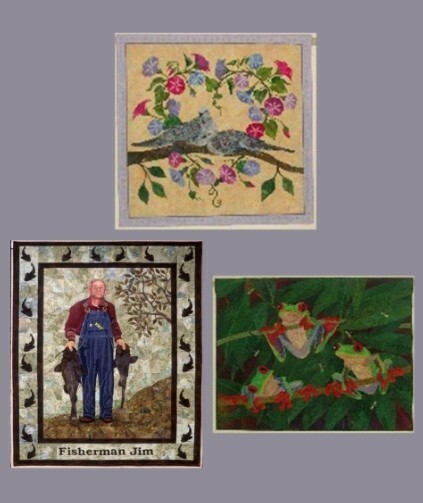 2010 – “Fisherman Jim” and “You Are My Sunshine” was exhibited at the International Quilt Association Quilt Festival in a special exhibit from the book of 500 Art Quilts. 2014 – “Let’s All Spring Forward” and “Bouquet of Roses” – Exhibited at the Figge Art Museum in Davenport, Iowa as part of the “Best of MVQG” quilt exhibit February 3 – 10, 2014. I gave an Art Talk on Pictorial Art Quilts at the Figge Art Museum auditorium at 7:00 pm on February 6, 2014. 2007 – “Old Town Window” at the Mississippi Valley Quilters Guild Quilt Show in Davenport, IA. 1998 – “American Blood Brothers” at the MVQG quilt show, Davenport, IA. 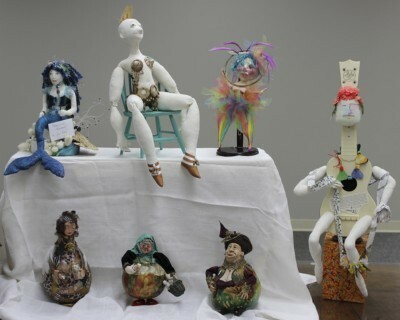 Artistic, detailed and amazing are a few of the descriptions used to describe the Soft Fber Doll Exhibit shown at Maquoketa Art Expereience last year! Various artists from the Quad Cities area in Iowa are returning with many new Soft Doll Fiber Art exhibits. This exhibit will not only be entertaining but a topic to discuss with family and friends! The group has been meeting, creating and displaying throughout northern Midwest cities for 15+ years; meeting every fourth Thursday each month except November and December when we move to third Thursday. Purpose: We explore all techniques, & latest trends and how they are created. We share our knowledge gathered from experiences and workshops. No one needs any art skills, or sewing skills, just curiosity and the love of creating. For nearly 50 years, The University of Iowa’s printmaking program has ranked among the best in the country. From class discussions of the history of printmaking to instruction in the making of prints, emphasis is placed on teaching students about significant historical print concepts and helping them discover new ways of adding to the printmaking tradition. The Print Program is known for both innovation and experimentation attracting artists from across the country as well as internationally to come and study in the State of Iowa. Lisa (Naffziger) Morris is a cartoonist and illustrator residing in Maquoketa, Iowa. She is a recent graduate of Savannah College of Art and Design where she earned her BFA in Sequential Art. Currently, she is illustrating a graphic novel with writer Allan Gross (former writer for DC Comics) and freelancing full-time. When creating comics, Lisa prefers a digital approach. Visual storytelling demands the quick, clean edits that only digital media can provide. Ann is currently based in Iowa City. She attended Smith College in Massachusetts. She completed a two-year apprenticeship in bookbinding at the Arion Press in San Francisco and a studio assistantship at the Women’s Studio Workshop in upstate New York. 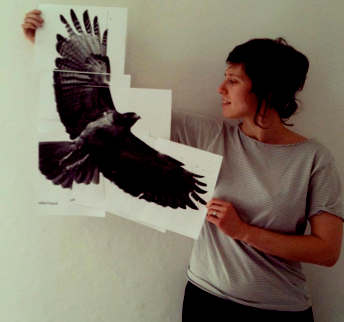 Anna was a 2012 National Endowment for the Arts artist-in-residence at the Minnesota Center for Book Arts, a finalist for the NYC Center for the Book Fellows Program and a 2014 artist-in-residence at Art Farm in Nebraska. She is currently enrolled in the University of Iowa’s graduate printmaking and book arts. Darin Musel – I have been creating one thing or another and the medium did not matter. It seems there has been one constant over time which has been the cutting, shaping, and manipulation of wood. So, with steel sharpening my tools and time sharpening my skills, I will always be a student to the art of woodcarving. 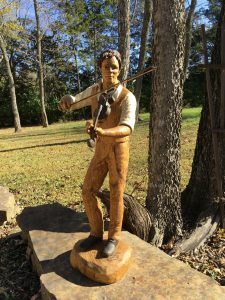 Rick Frels – During the last 30 years, I have been carving mostly animals and humans as well as doing chainsaw carvings. I have has taken some weekend and 5 day classes but I am mainly self-taught. 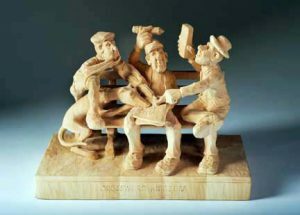 I live in Hillsdale, Ill.
Steve Russell – Carving gives me the ability to create something from a block of wood and I enjoy the challenge. I find there are two sides to woodcarving, one being the ability to be creative and the other to be realistic. I admire carvers who create something that when you look at it you can see a story unfolding. 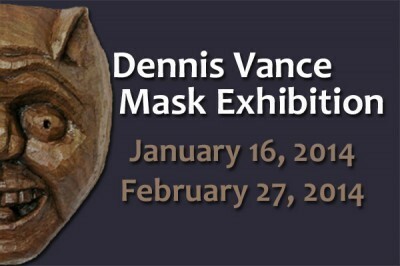 Dennis Vance – My style is strongly influenced by primitive cultures, especially Northwestern Native Americans, Oceania, Etruscan icons, and African cultural masks. My work varies from small sculptures and hanging pieces for indoors or outdoors to life-sized lawn and garden pieces and much larger totem poles. I have exhibited in numerous galleries in the Midwest. 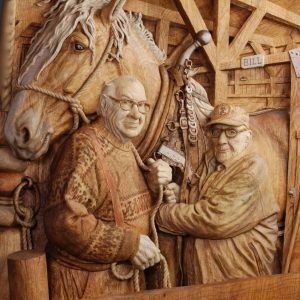 Pete Swanson – I am a Local farmer who has been carving for the last 15 to 20 years. Jacob Langenberg – Currently a freshman at Coe College in Cedar Rapids, Iowa, I am a native Maquoketan. I began carving at the age of 6 with my Grandma Linda, first with power tools and then moving on to hand tools. I like to carve animals, snowmen, and Santa’s. Linda Langenbergn Curtis – I am from Marion, Iowa. I began painting as a stress relief artist and eventually moved on to woodcarving in 1989. I have taught all of my grandkids how to carve, including the eldest grandson, Jacob Langenberg. Kirt Curtis – I live in Marion, Iowa but grew up in northern Maine. I received my degree in fine arts in Rochester, NY. In 1985 be decided to carve professionally and began teaching carving classes as well as carving commissioned pieces, specializing in North American mammals. My wife, Linda Langenberg Curtis, and I now work as a team traveling around the country teaching carving. Bill Wohlford – Currently, I am chairman of the Arts committee for the Plus 60’s club. I have also chaired the Artists Advisory Counsel for the Figge, the CART (artist’s initiative) and served on the board of the International Woodcarvers Congress. I exhibit frequently at Quad Cities Galleries and also shows in Clinton, Maquoketa, and Galesburg. Three dimensional and bas relief works using wood as the primary media are some my most popular forms of art. My subjects vary from hyper-real, Daliesque, whimsical, impressionistic and expressionistic. John E. Evans is an artist working primarily in pastel and colored pencil. He is a retired art teacher who spent 39.5 years in the classroom. A graduate of the University of Northern Iowa with a bachelors degree in art education, John began his teaching career at Lynnville-Sully where he taught K-12 art for 19.5 years. He joined the staff at Pekin in 1992 where he taught Middle School Art, High School Art, Photography, Computer Graphics. John maintains a studio in his home and is frequently found painting en plein air. 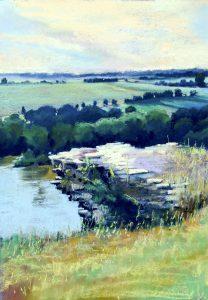 He is a charter member of the Iowa Pastel Society, a signature member of the Iowa Pastel Society, President Iowa Pastel Society, works in many private collections and is represented by Iowa Artisans Gallery. Bob Felderman is a retired U.S. Army Brigadier General with 36 years in the Army, Air Force and National Guard. Upon returning from 6 years of active duty to Dubuque, Iowa in 2010, friends, family and entertainers began calling him “General Bob”. In selecting the proper name for his photo business, his daughter (a professional photographer) recommended it was appropriate to honor of the men and women military Veterans with whom he served proudly with around the world – thus became General Bob Photography. As a professional independent entertainment photographer and writer, his photos range from entertainment events to landscapes to portraits to travel locations to commercial photography. General Bob has had the opportunity to meet & photo entertainment greats such as the former Davy Jones of the Monkee’s, B.B. King, Gregg Allman, Pat Benatar, Don Felder (formerly of Eagles), Bret Michaels, Peter Frampton, Rick Derringer, Rodney Carrington, Steve Lukather, Rick Springfield, John Tesh, Jewel, President Barrack Obama, Kari and Billy, Louis Prima Jr., Lita Ford, Yahov Smiroff, Frank and Danielle of American Pickers; and great bands Little River Band, Hairball, Spazmatics, Drive-by Truckers, Red Hot Chili Pipers, Fuel, Here come the Mummies; and many artists that perform as tributes to Johnny Cash, Red Skelton, Lynyrd Skynyrd, Zee Zee Top, Tom Petty, Johnny Cash, Hairball, Elvis, Styx, Journey, Cream and many more. He has performed as a media photographer for numerous entertainment and style magazines, including a gig as White House Photographer for local Dubuque events. Gerald Marella is a nature photographer who enjoys all aspects of God’s creation. Gerald especially enjoys connecting with a subject which allows him to create a more intimate photograph. Although he likes to photograph mainly in the Tri-State area, he also likes to travel to different locations to photograph migrating species as well as landscape, cityscape, and local culture. Gerald is currently a member of the Dubuque Camera Club. Whether the medium is watercolor or monochrome, the process of creating the work involves applying many layers to create an image. In watercolor, it’s a combination of washes, glazes and dry brush. In monochrome works, graphite, carbon and charcoal, the process of layering involves applying, smearing, erasing, and re-applying until a satisfactory combination of contrast, value and texture are achieved. Jac Tilton is a former art educator and has held various management positions in advertising, marketing, graphic design and web development during his career. He has worked almost exclusively in watercolor for most of his career, but recently has added non-representational works in graphite, carbon and charcoal to his portfolio. Tilton’s drawings have been in included in the Strokes of Genius: Best of Drawing series, volumes 2, 4, 5 and 6 and his watercolor, “Waiting for the CTA”, received Best of Show honors at the Illinois Watercolor Society’s 29th National Juried Exhibition. 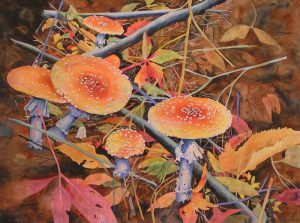 His watercolors and drawings are in private collections in the U.S and Canada and a signature member of the Illinois Watercolor Society and a former member of the Board of Directors and Signature Member of the Iowa Watercolor Society. 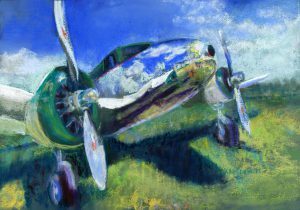 Jac is a member of the National Watercolor Society and the Transparent Watercolor Society. I have a fascination with “rust, ruin and physical collapse.” Most of the structures and objects in my watercolors and drawings have a uniqueness that only age and existence can provide. The color, texture and overall patina cannot be created artificially, but must be developed through the act of being. The results of their use, abuse, neglect or abandonment makes for very interesting subject matter. Sometimes a chance juxtaposition is a key element in the image: a shiny bus with a derelict house and woods or a car carefully painted to emulate the Stars & Stripes and then deliberately mangled in a demolition derby. The figurative watercolors result from capturing people in a candid moment when they are the most natural and least self-aware. Capturing people in interesting but un-posed situations requires patience, close observation and anticipation of when something visually interesting might occur. Asking someone to pose immediately creates a “what do you want me to be” situation. Capturing someone unaware provides a “this is who I am” perspective. This exhibition explores water as a metaphor for the continuity of thought and emotion, or the lack thereof. Using personal memories and interactions with water, these works represent the space, time, and emotion spent finding and losing oneself at the water’s edge. Sarika Sugla is an artist, printmaker, and curator currently living and working in Iowa City. 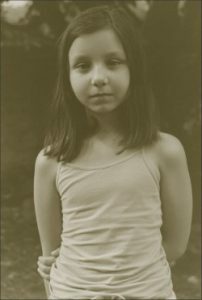 Sarika was born and raised in New Jersey by her lovely Puerto Rican mother and Indian father. 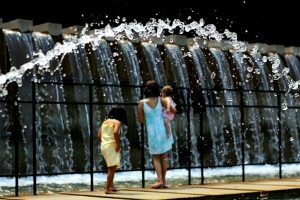 Through family trips and constant proximity, water became an intricate part of her life and way of thinking. Sarika received her MFA in Printmaking in 2014 and her MA as an Iowa Arts Fellowship recipient in 2013 from the University of Iowa. 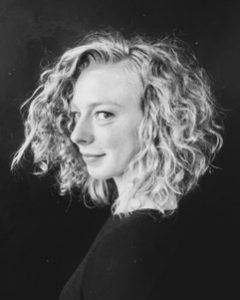 She also received her BFA from the Maryland Institute College of Art in 2011, and has worked as a printer for various print projects at the Brodsky Center for Innovative Editions in New Jersey. She has exhibited widely throughout the United States, as well as internationally in Portugal. Currently, Sarika works as an Assistant Curator at the University of Iowa Museum of Art and also works as the manager of the Times Club Gallery, a small cafe exhibition-space in the historic Iowa City bookstore, Prairie Lights. Water, an element of constantly changing states, is an ideal lens to to help us see, understand, and respond to the world, our flooding memories, and the morphing challenges that are presented to us daily. Using water as a metaphor for the fluidity of our experiences, my work explores concepts of time, change, and continuity in our increasingly abstract lives. I use water as a medium, both as an artistic material and foreboding entity, to reflect upon our everyday lives and as a way of understanding one’s relationship to the world. Photography is used as a means of documentation, print as a tool to share the interpretive nature of memory and image, and text is included to describe changing psychological states. Collectively, my work acts as an archive and collection of water-related thoughts, ideas, and emotions. We all have extremely unique relationships with water, but its importance and presence is shared. From our individual, daily experiences with water for drinking, cooking, and cleaning to the idyllic aquacolored beaches for the picture-perfect vacation, taking note of the presence of water can be a curious marker of each of our lives. My work hopes to open viewers to the idea of self-defined spirituality, or collecting your own alliance and material, regardless of religion. Everybody is searching, and by using water as a vehicle, my work offers away of finding continuity amidst the changing pace and nature of our world. 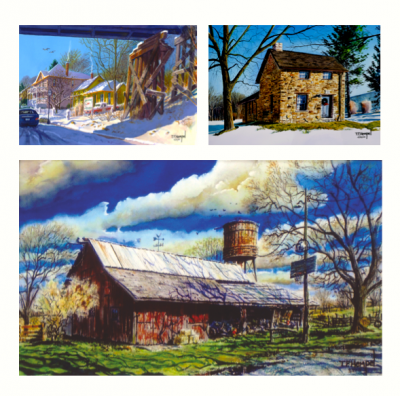 Tom Hempel is one of the Quad Cities area’s most talented and creative watercolor artists. More importantly, he is also my friend. 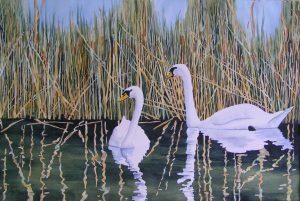 Tom has completed over 1,200 original paintings depicting homes – new and old – schools, universities, public and private office buildings and churches. His work is widely distributed both in and outside the Quad Cities. Though well known for the work he has done to date, Tom has recently begun to expand his creative horizons by painting what he “sees” with his eyes and heart and not so much from photos he has taken. He is doing more “whimsical’ work, combining several different scenes to make a new scene. As a result, he has launched a new era of creativity. Tom’s paintings have been featured in local newspapers on both sides of the river and recently has had over forty of his paintings displayed in an exhibition at a new business in LeClaire which received high critical praise and led to several paintings being sold. Tom was drafted into the Army in 1966 and served two years, one in Vietnam. After his return in 1968 he continued his art training at Palmer Junior College in 1969 – 1970. In 1975 he married Marti Carstensen and it was Marti who rekindled his love of watercolors and asked him to paint a picture for her. Since they both shared a love and admiration of the old buildings in East Davenport Village, he painted a watercolor of Boyler’s Iron Works which was the first painting Tom sold. The rest is history. 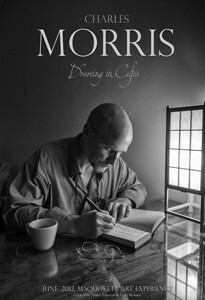 Tom’s artistic role models are Paul Norton, a local artist, and John Pike of New York. He continues to evolve in his art and his latest works are more vibrant and imaginative. I have enjoyed watching Tom enter into this new chapter in his painting career and look forward to more creative works. 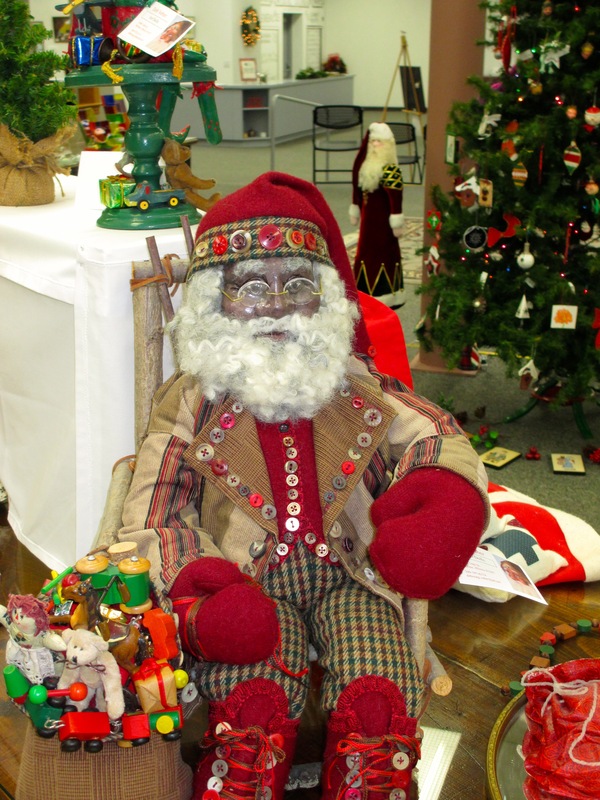 Art Figures of the Quad Cities Doll Exhibit shown at Maquoketa Art Experience last year! Various artists from the Quad Cities area are returning with many new figures. The group has been meeting, creating and displaying throughout northern Midwest cities for 15+ years.We explore all techniques, & latest trends and how they are created. We share our knowledge gathered from experiences and workshops. No one needs any art skills, or sewing skills, just curiosity and the love of creating. This is club for people who want to learn to create an artistic figure using a variety of mediums: 601 Brady St. in Davenport, Davenport Public Library (room 121), 4th Thursday, 10:00 am. Born in Kewanee, Illinois, Ted has been an artist most of his life. After graduating from high school and serving in the Navy, he attended the University of Illinois where he received a BFA in art. He worked many years as commercial artist and art director before starting his own commercial art and advertising agency. Ted is currently a full time artist. He produces art of his own liking and does commissions for the public, corporate and individual requests. His main interests involves creating works of art featuring the human figure. 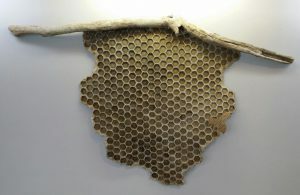 Ted’s work includes many different interests, materials, media and techniques. Ted also is a pilot and was an accomplished ice skater. Stan became interested in art at the University of Northern Iowa. Painting was his favorite class and he graduated with a BA degree in art education. After joining the Air Force, Stan was trained and worked as a photographer. After serving in the military he was accepted into the graduate program at the University of Iowa where Stan studied fine art photography with a secondary emphasis in drawing, earning an MA and a MFA degree. Stan taught middle school art at Clearcreek Community School District for four years, followed by working as a medical photographer at the University of Iowa Hospital for three years. He then became a high school photography instructor in the Des Moines Public Schools for 25 years. Now retired, Stan enjoys painting, drawing, abstract photography, and playing the bass guitar. As an artist I enjoy abstract images regardless of the medium. When painting or drawing I make gestural marks and lines of various sizes and energy levels in order to create an interesting design. I am also intrigued by the interaction and changes that occur when color and value are used to produce an overall harmony in a painting. My approach to painting is close to music composition or the improvisation of a jazz musician. Rather than trying to represent an object or scene, I start a new painting or drawing with an interesting mark or shape and then react to what is on the surface to intuitively determine what to do next. I have no predetermined plan or design but allow the process to determine the final result. This allows for creative surprises and end results that could not have been made ahead of time. I find this approach to be an exciting way to draw and paint and enjoy the spontaneous results that occur. Our mission… is to create, foster, and promote our unique regional arts environment, by supporting the arts, art education, and the artists in Eastern Iowa. By providing funding, advocacy and support services to the region’s arts organizations and artists, we strive to build a strong arts program now and for the future. Our vision… is to recognize all of the arts and their importance in our region. We envision Bellevue as a region where the arts inspire our innovative spirit, celebrate our rich cultural diversity, recognize our valuable history and encourage our individual and community involvement. Born and raised in Los Angeles, artist Halle Siepman moved to the San Francisco Bay Area to pursue her passion for painting as a teenager. 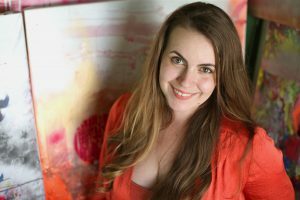 Her education includes a BFA degree in Painting and a BA in Spanish from Sonoma State University, and more recently, an MA and MFA in Painting with a minor in Printmaking from the University of Iowa. Between degrees, Siepman traveled throughout the world in search of artistic and architectural inspiration; she eventually landed in the broad plains of Iowa where her parents were born and raised. She is the recipient of the Iowa Arts Council Art Project Grant 2015, Mildred Pelzer Lynch. Fellowship 2014, Stanley International Research Award 2014, Executive Council of Graduate Professional Students CGPS Grant 2014, 1st place winner in the Creative Works Category at the James F. Jakobsen 2015 Annual Conference, IDEA Peer-to-Peer Award at the Marion Arts Festival 2013, and the California State University Summer Arts Program Chancellor’s Award in Painting 2011. She was selected along with another Iowa City artist to exhibit three paintings at the Formal Office of the Lieutenant Governor in the State Capitol of Iowa in Des Moines for six months scheduled for January 1st, 2016 funded by the Iowa Arts Council. Her exhibit at Maquoketa Art Experience marks her 7th solo exhibit and 7th group exhibit in the last 12 months. Inspired by the precision of linear perspective as a mental construct, I explore the history of architectural thinking, from ancient sites in Greece to the pioneer Le Corbusier and the asymmetrical postmodern architecture of Frank Gehry, Santiago Calatrava, and Zaha Hadid. 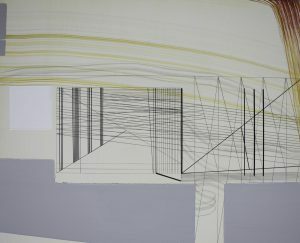 My artwork embodies experiencing architectural space first-hand. Recently, I stood inside the Parthenon, ascended a medieval staircase, and was situated on the level that surmounts the columns, in the open air of Athens. It is this type of unique experience that I want to share with the viewer and to allow the viewer to navigate aimlessly until it evokes a personal memory. My architectural imaginations are therefore not only about architecture but also about the viewer’s perception and memory of that space and mass created as one experiences it. It is important to me to examine the conflict between passively living in architectural space and actively forging my own space. In my early childhood, I questioned my physical surroundings and started drafting ideal architectural homes in vast, open spaces to “depart” from the experiences of growing up with seven siblings in tight quarters with little privacy. Drawing lines helped me define my role within an otherwise challenging realm. I am an artist using geometric forms to manipulate a fictive painted space; creating artwork is my way of forging my own space. By extension, I call on the viewer to reimagine his or her world by examining architectural and geometric potential in the environment. Janice’s paintings are inspired by her love of all God’s creations. She is captivated by the abundance of objects and life found there and by the vast assortment of colors, textures and curiosities. Hiking the woodlands of Iowa, gardening, and paddling lakes and rivers have provided her with wonderful subject matter. She invites viewers to pause for a moment and take a closer look at their surroundings. She hopes they will capture a moment in agarden or on a woodland path that will transport them into the peace and joy that resides there. Janice considers her paintings a respite from the everyday hustle and bustle of life and hopes that viewers will feel the same. Her message is slow down, take a deep breath and see the beauty that is all around you. Iowa City, IA has been Janice’s home for the past 29 years. 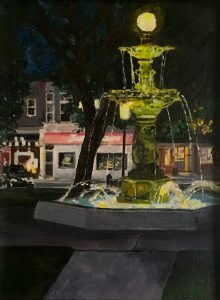 She has exhibited in juried shows across the state and with the Iowa Watercolor Society. While living in New Orleans, she became interested in translucent watercolor painting and began taking classes. She continues her studies with various workshops, but for the most part is self-taught. She finds the mixing and blending of pigments on and off paper to be exciting and she delights in the challenge of creating a successful work of art. Over the years she has developed her own style of capturing the beauty found in nature. Janice loves to work with rich saturated color and enjoys trying to capture the play of light and shadow. Currently she is hosting an artist’s studio group each Wednesday afternoon at the Johnson County Senior Center in Iowa City. Fred’s reputation was initially established through the major non-bird North American carving competition. It was fortunate that his entry into carving came just as the revival of interest in the genre was within a decade of reaching its peak. The International Woodcarvers Congress of Davenport, IA, the International Woodcarvers Exhibition of the Canadian National Exhibition of Toronto, Ontario, and The Wood-carver Showcase of Silver Dollar City, Branson, MO, offered annual Best of show purses ranging from $2,00-$5,000. In 1983, he took a record five Best of Group awards at the Iowa show and followed that with Best of Show in Toronto. He would take three more top awards at Toronto before management issues ended that show in 1991, three best of shows in Missouri in the four brief years the show ran, and around a dozen top honors at the Iowa show, the only one of the three yet existing. Most recent Best of Show at the International Woodcarver Congress was in 2011 with the life-size statue, “A Penny Saved…?”. (In 2010 Best of Show went to my relief carving, “Betty’s Spies,” with another of Fed’s reliefs, “Deck of ’51,” taking First Runner-up. 1993: “Beyond the Cutting Edge,” a dissertation on tools, sharpening, and beginning relief carving. 1994: “On the Principles of Carving in Mezzo-Relief,” the theory and practice in that genre as extrapolated from my own experience and observations; published by the Affiliated Woodcarvers, Inc., parent organization of the International Woodcarvers Congress. Marv was a teacher in junior high math and they went on strike. He picker-up a book by Andy Anderson and started carving for something to do. Retired from teaching in 1995, he has never quit carving. He lives in Fairbault, Minnesota. He is one of the original 12 selected to be in the Caricature Carvers of America. He is currently a member with the standing of “emeritus”. (A member, just not active on the circuit). This is an exclusive club, you must be asked to join and it is limited to 25 active members. Caricature Carvers of America celebrated their 25th year in 2015. Marv has focused primarily on caricature carving but has ventured into a more stylized form of caricature in recent years. Marv models his carvings out of clay before he takes it to the wood. He finds that this helps him to figure out the design, what tools will work and eases the carving process. It does not mean it will be an exact replica of the clay, but it will be close. Marv is a self-taught clay model using an oil base clay. One third of the time spent on a new piece will be on research and clay modeling. Marv is well known for producing complicated pieces out of one piece of wood. He has done some insertion, such as a fishing rod when necessary. He likes the challenge of making it out of one piece of wood, primarily basswood. He tries to get one complicated piece done a year. He also does smaller carvings and has donated artwork to different organization to assist in their fund raising. Mary Wells Exhibit | WORLD OF BLOOMS! from the University of Iowa and a Masters degree in Interdisciplinary Study. Charles has been working as a portrait artist since 1979. He has directed and produced numerous multimedia art events in Iowa City and New York City, bringing together artists, filmmakers, musicians, writers, and actors to create live, interactive installations. 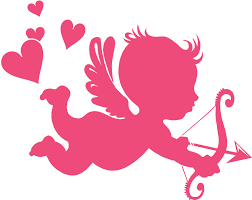 Each event was centered on a single theme suggested by the time of year in which they were presented (Halloween, Valentine’s, New Year). 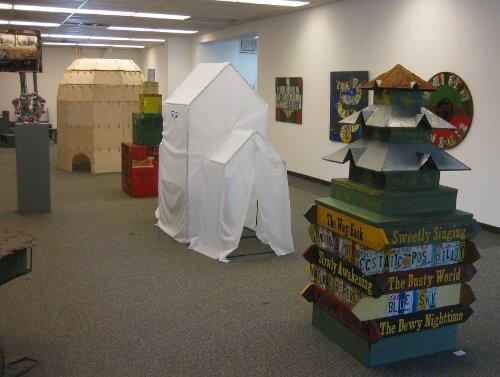 Currently he is showing works in various media at Old City Hall Gallery and at odd places in the region, illustrating a children’s book, and doing collaborative and multimedia portraits. My work has moved from the purely functional to more abstract expressions in my River and Ocean series and continues in that direction in my new exhibit. 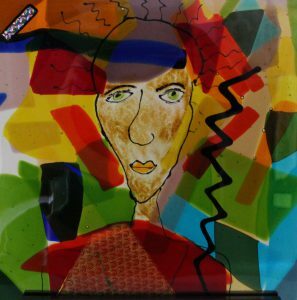 Glass isn’t often used for painting but for abstract designs and functional pieces. I wanted to make paintings where the picture is made purely of glass but one that evoked something more personal. I had in mind a project about people. No one in particular, anyone you might meet walking down the street; the people inhabiting slices of everyday life. I would use the warmth of melted glass as a way of conveying their inner warmth, thoughts and vitality. I wanted to explore their faces, their look: When you really look at someone, you see beyond caricature into the very things that make them unique. Beyond all that, the person I put into the kiln before heat and warmth are applied is different from the one who comes out. Sometimes they go in with a smile and come out with a smirk. Each piece in this exhibit led to the next, when a face came out of the kiln expressing an emotion or an idea of a person I’ve met, another face would come forward or a couple of faces together. There are more faces and colors to come from my kilns in the future. Barb Zehentner McKinlay began her life as one of the youngest members of a large Midwestern family in Dubuque, Iowa. Her father, a WWII veteran and a small business owner, ran several sporting goods stores with his family. While she and all her siblings helped out with the family business, several of them went to college to pursue creative careers in art, film, engineering and architecture. Her oldest sister was both a painter and art teacher, her younger brother an independent film producer. As a child, Barb liked to take art classes from neighborhood artists and spent time creating crafts, this continued on the side as she pursued an education in biology and a career in business. Growing up in a family business, it was natural Barb made a career in sales management and marketing. She worked for glass companies such as Kosta Boda and Simon Pearce, where training included onsite factory tours and in-depth education about the design and manufacturing processes of products. The creative process and the focus on composition and materials, design and function, fascinated her. She found inspiration in her professional life meeting and working with creatives of all kinds involved in the enterprise of making a commercial success of the work of designers and artists from Europe and the U.S. When she got the chance to blow glass on her own, her creative self was re-awakened a desire to make and sell her own designs. Today, Barb’s work can be found in stores, specialty shops, and galleries in the Midwest and throughout the country. 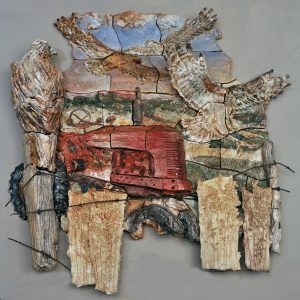 Her work has been featured in shows with other regional artists in Iowa and Wisconsin. Barb teaches glass design classes to adults in several Midwest cities and actively participates in a variety of classes and fundraisers for youth groups in Iowa, Illinois, and Minnesota. Barb’s functional art is available in department stores, specialty stores, and galleries in the Midwest, including the Nelson-Atkins Museum, Hall’s of Kansas City and Borsheim’s of Omaha. KC Barnes uses bold, vibrant color to transform a landscape into a glowing vision. Her paintings are conceptual, abstracted images of reality. The selection of palette and technique used by this artist, demonstrate her in-depth knowledge of the land. KC studied at the School of the Art Institute of Chicago and Northern Illinois University. 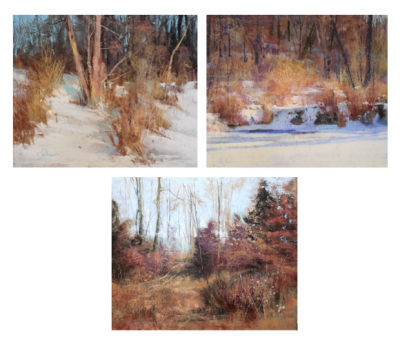 She has concentrated on impressionistic landscapes for over 50 years. She has developed a unique style and masterful blend of colors that transports the viewer into her radiant world. In 1989 KC was invited to show her work at the Governor’s Mansion in Springfield, Ill. Governor Thompson appreciated her work and invited her back to paint the mansion’s garden. In 1993 KC and her family moved to Iowa. Many of the works displayed in this Half Century of Art, are from the inspirational Iowa landscapes. 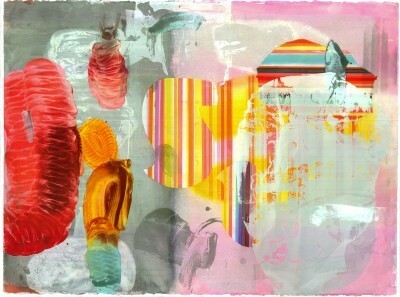 KC’s current work is inspired by a snorkeling trip to Hawaii. The abstracts merge the rolling hills of Iowa with her underwater visions. The abstracts merge the rolling hills of Iowa with her underwater visions. The Fiber Art Studio of Dubuque design and create original artistic works. The groups’ mission is to expand their creative knowledge with exposure to new techniques and materials. For the past 10 years this group, also known as FAS, has been meeting monthly from January through October. Each month a member artist presents a program which is either a demonstration of techniques or the program is a hands-on experience. These sessions enable everyone in the group to learn new skills, expand their creative knowledge and learn another aspect of an artistic technique that might never have been tried previously. Every member offers a unique talent and they are willing to share their expertise with the group. This exhibition shows how diverse the artist interpretations can be. Writer/photographer Kurt Ullrich lives in rural Jackson County, Iowa. Over the years he has written extensively for such places as the Chicago Tribune, Baltimore Sun, St. Louis Post-Dispatch, Milwaukee Journal Sentinel, Houston Chronicle, Minneapolis Star Tribune, Des Moines Register, and many others. His photographs have appeared in the Boston Globe, Washington Post, Chicago Tribune, Des Moines Register, and countless other news outlets. Since 2014 exhibits of Ullrich’s black & white photographs have been curated at the Dubuque Museum of Art in Dubuque, IA; Old Capitol Museum in Iowa City, IA; the Iowa History Center in Indianola, IA; the Beverly Arts Center in Chicago, IL; and the Lewis & Clark Interpretive Center in Sioux City, IA. Kurt’s book of black & white photos and essays “The Iowa State Fair” was published by the University of Iowa Press in 2014. I suppose it begins with a crude wooden cross sitting above a ditch on a long curve of highway, an otherworldly ribbon of fabric shawling in the summer breeze across outstretched arms. Later, in a nearby town, a guy says that five children died at that place a few months back and profound sadness fills in the awkward spots and I can’t think of anything remotely meaningful to say. A hundred miles away an embalmer dons a blood-born- pathogen-flak-jacket and waits for the next customer, maybe an old man, wheezing the last one out, loved ones at his side, or maybe a child. Across town a florist, resolute and beautiful in the way women are who have owned their own businesses for decades, puts together another bouquet for another grieving family or another happy bride, and the names all run together. Out on a hot summer street a legless drummer pounds away on a plastic pail, asking for money, the sun reflecting heat in a way that gets to all of us, and he smiles on occasion, beating back the unfairness of it all, a world he can only judge from the waist-high vantage of a wheeled chair, and just down the street a couple of frat-boy types puff on cigars from the back seat of a vintage Rolls Royce rolling around midtown and damn isn’t the world a truly peculiar place. A second-generation service station owner still handles the pumps for his customers, just like his father before him, and surely he must be the last one in the country still offering actual rather than implied service. Corporate America would do well to spend a day with him, or perhaps with the young man who occasionally keeps his dragster on the family farm of his growing, because he can teach a class about patience and quiet times in preparing his machine for deafening sounds on hot summer nights when a drag-strip Christmas tree counts down to blast off and it’s all over in a few seconds. American flags are ubiquitous, even on chairs at a car show, a new tolerance and maybe an unnecessary jingoism that didn’t exist half a century ago when we were condemned and called unpatriotic for not wanting war and for having a flag embroidered on a blue denim jacket. Other flags show up as well. One day after nine African-Americans are gunned down in a South Carolina church by a racist I’m chatting with a be-hatted cowboy at a rodeo and it isn’t until I see the photo later that the Confederate flag on his shirt grabs me and says wait a minute, and all while holding a beer produced by a company monumentally influential in the Nixon White House and you wonder how we can be so different and still occupy the same space and this is either a great country or God knows what. As the wicked witch in Oz intoned ‘Oh what a world!’ and signs of a savior show up everywhere, on a street corner handing out pamphlets, on the sides of a truck outside a sad residential motel and, expectedly, in a place of worship. On a quiet Sunday I stop by a country church and it’s mostly the elderly who attend but in the front row the youth are offered a special message and my heart aches at how hopeful and beautiful they all are. The same beauty shows on the face of a young homeless woman who, despite her hunger and her circumstances, looks directly at the camera with a slight smile, wanting to look her best, still trusting in the future of a world that may not deserve her trust. And of all of these people perhaps she’s the one we should emulate, a woman in trouble who maintains hope because what else is there. 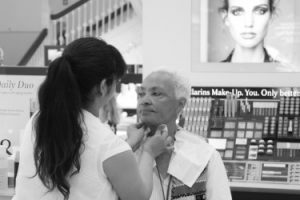 An elegant woman sits on a high stool in a fancy department store while another puts make-up on her face and I stare too long, and I wonder if she has known love and I can’t figure out why it matters or why I should care, because I hope she has. Does she have anything in common with a counter-culture hitchhiker who settles next to a highway with her computer open, likely warmed by a Wi-Fi hotspot from a nearby house, or even the pretty ROTC blonde newly graduated to Second Lieutenant and my gosh you just can’t help wondering these things. In his glorious song “Everyday People” Sly Stone mentions a butcher, a banker, and a drummer and I leave the banker in a folder, not yet ready to hang a moneylender on a wall, preferring the company of good-looking, happy newlyweds or a hard-working welder who simply does his job, making no demands except to be treated fairly and left alone. These people cause me to want to spread my old wings, even just a little, because in the end we’re all stuck here, earthbound, people who will always fail, people who would be wise to make the best of whatever time remains. It’s what everyday people do. Phil Roeder has worked for 30 years in public relations and communications, primarily in and around the public sector. Today he is the director of communications for Des Moines Public Schools, Iowa’s largest school district. His work experience includes serving as deputy chief of staff of communications for Governor Chet Culver, as a spokesperson to U.S. Senators Tom Harkin and Max Baucus, and as a deputy to Illinois State Treasurer (and former Governor) Pat Quinn. My goal is to make simple, honest photographs. When armed with a camera, I look for the potential in anything and anybody to become a compelling image. This selection of photographs is an example of my work towards that goal. 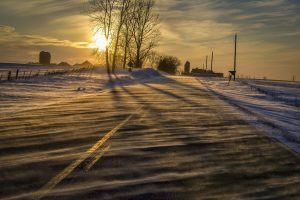 From Iowa landscapes to urban street-scapes and from museum-goers to sports competitors, these and other images capture what I find to be simple, yet compelling, moments and perspectives. My approach to the art and craft of photography is best summed up in a comment by the famed street photographer Garry Winogrand: “I photograph to see what the world looks like in photographs.” These selected works are a part of the world I see. For more information visit www.philroederphotographs.com. Farm Life in Iowa is an exhibition of thirty photographs taken by A. M. “Pete” Wettach (1901–1976) from 1925 to 1960—thirty-five of the most revolutionary years for farming as a way of life in Iowa. Working as a freelance photographer based in Mount Pleasant, Wettach recorded changes in farming practices at the same time as he honored traditional values of family and self-sufficiency. Wettach’s unique interpretation of the family farm comes from his documentary style and keen compassion for his subjects. The exhibition was curated by UIMA Senior Curator Kathleen A. Edwards. The photographs in the exhibition were printed by Steven Tatum from negatives in the A. M. Wettach Collection, State Historical Society of Iowa, Iowa City. Silver gelatin print, 20 x 24 in. 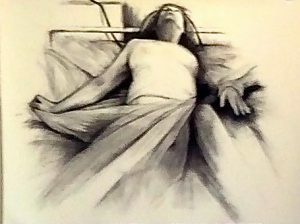 I choose charcoal for my medium to better express the darkness of her story. I present my drawings unframed as I did not want to put another barrier between my grandmother and the viewer. In the three years I worked on this project I have been very moved by all the people who have entered my studio and shared with me their stories of the effects of mental illness on their families. I was drawing for my grandmother but came to see there was a much larger audience. Born and raised in Dubuque, Iowa I currently make my home in Cedar Rapids, Iowa where I work out of my studio in the historic Cherry Building located in NewBo. I am largely self-taught including numerous portrait workshops by nationally known artists, classes at Mt. Mercy University and Kirkwood Community College. I continue my study of figurative drawing at Sunday life drawing at Coe College. I have done commission portraits and my artwork has appeared at various venues, including the Campbell Steele Gallery in Marion, Ia and CSPS in Cedar Rapids. My medium is charcoal, oil and acrylic. My interest in portraiture has as much to do with emotion as it does in getting a likeness. I find myself drawn to a pose where the subject is looking into the eyes of the viewer creating an intimacy between the viewer and the subject. Iapproach my work with an inspiration and then take time to search art books and magazines and online to see how other artists have handled similar creations. I admire the work of Mary Cassatt and Jenny Saville, especially Jenny’s drawings of her pregnant with her one year old squirming in her arms. Pauline is a self taught artist winning a number of first place ribbons from area shows and has chosen to move beyond fabric to add metal, paper, paints and dyes to her work. With that change in direction she has been accepted into 7 shows of which 4 were juried at the Dubuque Museum of Art. This past September as part of a Fiber Arts group she exhibited her work at the Maquoketa Art Experience in Maquoketa. IA. Pauline lives and works in Dubuque, IA. 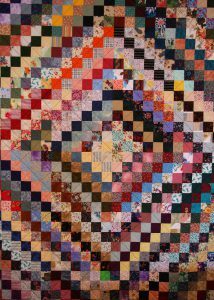 In May 2000 Pauline co-curated a traditional quilt show held at the Dubuque Museum of Art. For the past 7 years she has judged Needlework at the Dubuque County Fair. 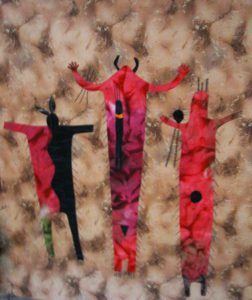 This exhibit features several distinct art forms such as Notan, Encaustic, Eco and other dyeing processes, Art Quilts and 3 dimensional work. 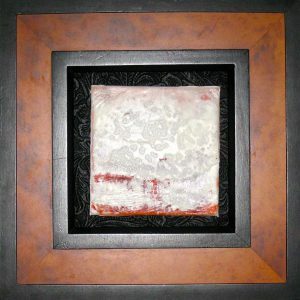 Encaustic means “to burn” and is art that uses melted beeswax applied to an absorbent surface on a rigid substrate. Adding wax gives an art piece a certain luminosity and glow and because of the layering aspect creates mystery and a dreamlike aspect that I really like. 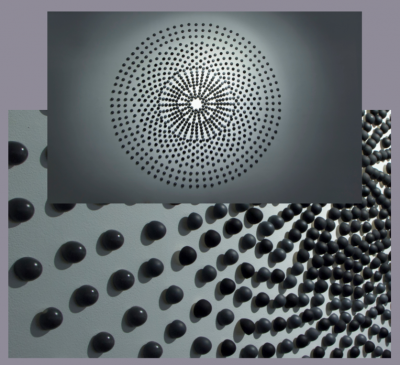 **Several pieces feature paper and metal as the juxtaposition between fragile and strong are as impressive in contrast as the Notan’s black and white aspect as works depicting extremes. 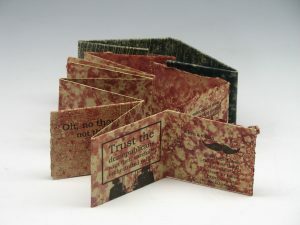 Joseph Lappie is an Associate Professor in Art at St. Ambrose University, teaching book arts, printmaking & papermaking. His work has been shown nationally and internationally, with his artist’s books in over three-dozen special collections across the country including Yale, The Art Institute of Chicago, and the University of Wisconsin. He received a BFA in Painting and a BFA in Graphic Design at Ball State University and a MFA in Interdisciplinary Book & Paper Arts from Columbia College Chicago. Andrew Huot is a book artist and bookbinder in Atlanta, Georgia. His artwork uses the book form to mark his observations about his surroundings. He uses marks, maps, photographs, and patterns to take our surroundings and abstract them, making them public as well as personal. He operates Big River Bindery, a shop for bookmaking and letterpress printing, book repair, and design. He has a Masters in Book Arts from the University of the Arts in Philadelphia and teaches bookbinding and preservation for the University of Illinois, and conservation for the International Preservation Studies Center. He exhibits his work widely and it is held in over 50 university library collections. Living in the Midwest has influenced my style of painting and choice of subject matter significantly. Many of my pieces depict very common scenes I have experienced. As a child, I spent countless hours playing on the riverbanks and wooded areas in Central Iowa. Even today, I continue to be intrigued with nature and the way sunlight and shadows help define the landscape. I continue to spend my mornings hiking and sketching the rugged landscape along the Iowa River near my home. 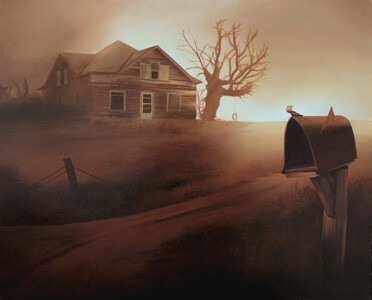 My goal is to paint relatively common scenes in a more dramatic and interesting way. Most of my finished works are the result of reference photographs and on-location (plein-air) studies. 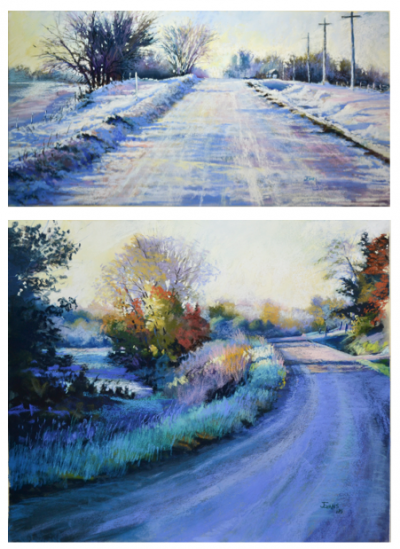 Tom been fortunate to study with several well established professional landscape artists including, Albert Handell, Marc Hanson, and Kim Lordier,. For the past several years, He has worked primarily in pastels and oil paints. He plans to continue to explore these two mediums and is looking forward to many more years of painting and conducting workshops. 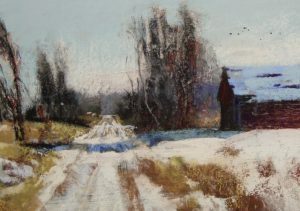 Tom Christopher has explored in depth the Iowa landscape near his home and studio, recording the nuances of changes in season and light. The landscapes of this part of the Midwest reveal their beauty in subtle ways requiring patience and dedication. Adina Huckins grew up with a family tradition of art and wood sculpture. 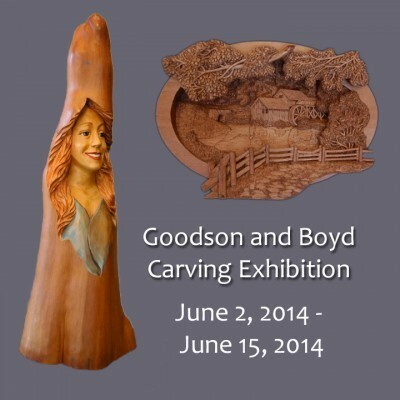 She has been carving professionally for 30 years and also teaches woodcarving. During that time she has won numerous awards and been recognized for her artistic achievement. Her sculptures reflect a strong emphasis on design and expression of feeling, and an understanding of a variety of subjects and styles. She feels that wood is a unique element for sculpture and is often overlooked as a medium, and has chosen to pursue woodcarving in order to further it in the arts. I cannot remember a time when woodcarving and art were not central factors in my life, or did not permeate every house I lived in. I have always been heavily involved with woodcarving and have never worked in any other field than art. 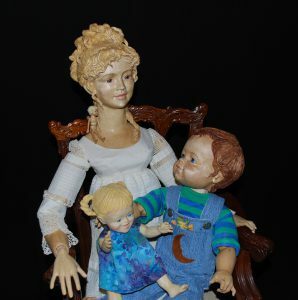 I grew up deep in the Boston Mountain Range of the Ozarks, as the second daughter of the Denton family of woodcarvers, not intending to be a woodcarver, or indeed an artist in any field. In those days, I still thought there was a job description for raising horses. However, as I grew up, I began to understand the value and originality of woodcarving as an art form, and to appreciate the unique direction from which my family approached this form of sculpture. I hope that my style clearly reflects my upbringing in the woods and close to nature, and combines it with a love of classical art. 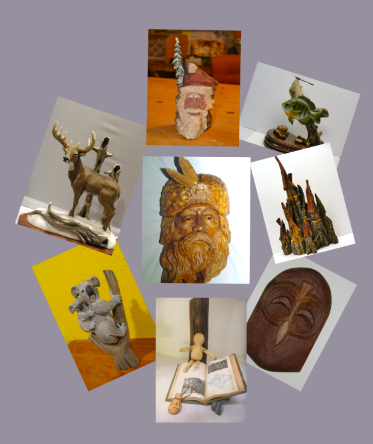 I have been carving professionally for forty eight years, and have been teaching woodcarving and sculpture since 1986. In 1994 I opened my own school of wood sculpture. The Ozark Mountain School of Sculpture is currently housed in a log cabin on the family property, where the quiet, undisturbed atmosphere and close proximity to nature foster creativity. Students at all levels of sculpture are welcome in the classes. ~Twice a nominee for Arkansas’ Living Treasure Award. ~Featured in magazines, newspapers, and television. ~Judged many woodcarving shows, including the International Woodcarvers’ Congress. ~Won hundreds of ribbons and awards. ~Featured with my family in venues such as National Geographic Magazine, television documentaries, and other shows. After a college career focused in the fine arts with an emphasis in clay, I founded a studio in the middle of the USA and vowed to make it work. Motivated to maintain my identity by my instructors in four universities, I avoided areas of the arts that compromised individuality for the ubiquitous commercial style that looks the same from east to west. My style, surface, and method make my work my own. It is more important to me to maintain the spontaneity of the surface than the identity of the subject portrayed. I want to see the clay and the gesture of the subject expressed through how I worked the surface. To me it is all about the surface. Over the years my work has become increasingly more colorful and more playful. My themes have expanded to encompass animals in motion, under-water worlds, human aspirations and human history. Part of what I do is also engineering. I have designed installations that wrap around building corners, follow large curved surfaces, and adorned plaster, brick and stone walls. Working in clay I have derived a profound respect for the earth and what it has to offer. The malleability of clay allows me to create virtually any image in as much or as little detail as I wish out of the simplest material and with confidence that it will last hundreds, even thousands of years. In the decades I have been working in clay I have often thought about the days as a boy when I saw the rusted remnants of old cars, barbed wire and old machinery thrown in gullies to help slow erosion from farm fields. As young adults we knew these dump sites as places where wild animals used our refuse for shelter and as a hunting ground. I was aware even then of the contrast between nature and the rusted remnants of human activity.This exhibit is about animals in motion and wild things in the human habitat. Ellen Wagener says she knew her life’s calling before she hit kindergarten. “I really wanted to be an artist, because when I grew up in DeWitt, there was a mural in the post office done by John Bloom,” she said of the native DeWitt artist known as both a Grant Wood protege and as sculptor Isabel Bloom’s husband. “It was mesmerizing to me, because it was the first real painting I’d ever seen. I was stunned,” she recalled of her weekly trips to the post office. “This painting really captivated me and I was committed, by the time I was 4 or 5 years old and finger painting, that I was going to be an artist.” And indeed she has. After graduating from the University of Iowa and Corcoran College of Art and Design, part of George Washington University in the District of Columbia, she returned to her home state with a new perspective. I am inspired by traditions of the Hudson River School, American Luminism, and early twentieth century photographers. An observer of atmospheric and tactile qualities of land and sky, I create meticulous drawings evocative of luminous silver-gelatin photographs, built from sketches, memory, and photographs, revisiting sites to observe changes in crops, weather, or vantage point. “Connecting to where I grew up was really a mission for me at the time,” said Wagener, who also taught at the former Marycrest International University in Davenport. Nearly 15 years ago she moved to the Southwest, making her homecomings all the sweeter, she said. Rose Frantzen has been a working artist since 1987, exhibiting figurative, representational, and allegorical works in oil and multimedia in galleries across the country, including the Old City Hall Gallery in her hometown, Maquoketa, Iowa. She has had numerous one woman shows and participated in many group shows throughout the United States. “Portrait of Maquoketa,” her project for which she painted 180 portraits of her townspeople was exhibited at the Smithsonian’s National Portrait Gallery for eight months. 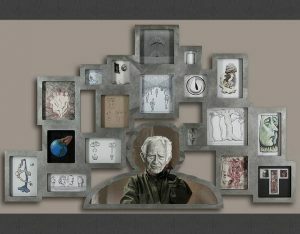 The expanded installation, “Portrait of Maquoketa – The Dimensional View,” has been exhibited at the Iowa State Historical Museum, and twice at the Figge Art Museum, which purchased the collection. The project led to numerous private/public art commissions and portraits, including the official portraits for USDA Secretary Thomas Vilsack and Iowa Gov. Chet Culver. Iowa State University commissioned the “George Washington Carver Mentors a Young Henry A.Wallace” painting, three Dean’s portraits, and “Faces of Iowa State,” a growing collection of alla prima portraits (now totaling 39) of noted ISU students, professors, and alumni. She is twice a winner in the International Portrait Competition of the Portrait Society of America, awarded 5th and 4th place and was the international winner of the 2016 People’s Choice Award. Her work is in public, corporate, and private collections nationally and internationally. She is a much sought after teacher of portraiture and figure painting, demonstrator, and panelist/lecturer in every region of the U.S.
Beginning in the 1930s, at the height of the Great Depression, Iowa State University (ISU) made it a priority to commission and paint portraits. The commemoration of presidents, deans, accomplished faculty and heralded alumni strove to honor the college’s heritage and legacies. This tradition continues today with the active commissioning of portraits by departments and colleges all across ISU and is celebrated through this statewide touring exhibition Faces of Iowa State. “Portraits are more than simply a record; they illuminate intelligence, importance, virtue, beauty, taste and other qualities of the portrayed person as seen through the eye of an artist,” said Lynette Pohlman, Director and Chief Curator for University Museums. 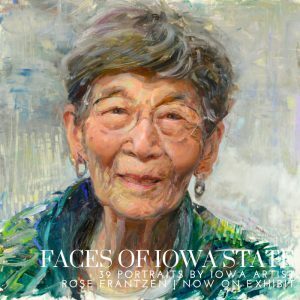 Painted on site Faces of Iowa State features the 39 portraits painted by Maquoketa artist Rose Frantzen. Frantzen’s art has been featured nationally, including an exhibit of her Portrait of Maquoketa project at the Smithsonian’s National Portrait Gallery. The exhibition subjects were chosen by Iowa State University’s colleges and select units. Portrait sitters included students, faculty, staff, alumni and individuals with close ties to the university. Faces of Iowa State is organized by University Museums with major support from: College of Agriculture and Life Sciences, College of Business, College of Engineering, College of Human Sciences, College of Liberal Arts and Sciences, College of Veterinary Medicine, ISU Extension and Outreach, University Library, Office of the Vice President for Research, and University Museums, Iowa State University, Ames, Iowa. 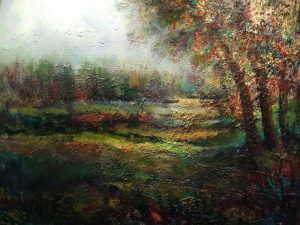 Rose Frantzen was born, raised, and returned to Maquoketa, Iowa, and the rural lifestyle and landscape continue to provide inspiration for her paintings. She attended the American Academy of Art in Chicago, the Palette & Chisel Academy in Chicago, and the Lyme Academy College of Fine Arts in Old Lyme, Connecticut. After extensive traveling, she returned to Maquoketa, Iowa and purchased the old city hall with her parents, renovating the building and creating a large gallery with extensive studio space. Within her newly developed studio, Frantzen’s Portrait of Maquoketa began as a project to document the people of her hometown and developed into 180 portraits which were then exhibited at the Smithsonian’s National Portrait Gallery. She has continued to paint Iowans as she has gained more success, including the remarkable dual portrait of George Washington Carver and Henry Wallace (Do you Know What’s Inside This Flower? George Washington Carver Mentors a Young Henry A. Wallace) commissioned by the College of Agriculture and Life Sciences at Iowa State University. This painting depicts the young Henry Wallace in a moment of absolute concentration as he is in the midst of a lesson about plants from George Washington Carver. Rose Frantzen’s lifelike and radiant examination of humans and our world bring together a long tradition of oil painting and portraiture with the skill and forward thinking of a 21st century artist. University Museums is a distinctive organization that encompasses two art museums, a National Historic Landmark historic home museum, a sculpture garden, and one of the largest campus public art collections in the nation. University Museums brings world-class exhibitions with educational programming to Iowa State University, actively acquires works of art to add to the more than 30,000 permanent collection objects, conserves and preserves collections, conducts and publishes curatorial scholarship, and fosters student engagement. Mike Leinhauser is a native of Bettendorf Iowa. He has taught adult education courses at night and classes through Scott Community College and one through Lincoln Center for the Arts in photography. Mike enjoys sharing his knowledge and talents in photography with others. He has also exhibited with the Photo Image League group. In 1966 my dad took a couple of photos of my new bride. I was taken by them, loved them. Out of the service in 1970, I received his camera and darkroom equipment and figured I would teach myself how to use this stuff. I read a lot of articles and looked at a lot of photographs to make sense of it all. I took some photos along the way and finally got tired of going to classes where the instructors were just showing off their fancy equipment and decided to teach classes myself. Foggy mornings and inclement weather is a time not too many people go out to photograph. This has suited my needs and did wonders to the backgrounds and I enjoyed the quiet. I just photograph whatever appeals to me, as you can see in my images. What have I learned up to now? Maybe I should have applied myself more. I have three passions in my life. My family, my work, and my photography. I will leave it up to you to decide their order of importance. I can only say that my life would be incomplete without all three of them. Obviously there are more but these are the three things that occupy my conscience being at any given moment. For those who have known me for a long time would wonder “What about golf?” I would answer that anything, action, or person that would treat me as badly as golf has cannot be considered a passion in my life. Golf! She is a harsh and unforgiving mistress, which I shall not suffer anymore. Except of course on those rare occasions where it is an event type format. My family is the wonderful woman I married 39 years ago. She is my best friend, life partner, and I love her dearly. My Daughter who is building a great life with a wonderful man and they now have a three children, Joshua, Gabby, and Austin. My Son has become an incredible salesperson and is now managing a sales department for one of the largest retail businesses in Cedar Rapids. My work is and always has been centered on helping people and providing service to others. Doing something for people that perhaps they cannot do for themselves. It was why I originally got into law enforcement and it is why I later turned to the development and nurturing of human resources in the work environment. This work gives me purpose and a reason to get up in the morning. My photography, which has been a part of my life since my parents (who were very poor) first helped me buy (I had a paper route at 9) a Brownie 127 film camera. 1977 I bought my first 35mm film camera and thought I had made the big times. In 2000 I bought my first digital camera and it unlocked a fire storm in me that wanted to create images and capture memories. Today I have four Nikon DSLRs and yes it is way more equipment then I need but I am truly happiest when I have a camera in my hand and up to my eye. So if it is more than I need then I am guilty of being selfish but hopefully the images I capture will bring others the same level of enjoyment they provide for me. For the last nine years in particular I have read books, taken on-line classes and studied hard to understand the art of photography. I smile inwardly when someone pays me the highest complement that I have” a gifted eye for photography” because I now know the work and diligence that has gone into that. I probably will get this quote wrong but it goes something like “ability is when loads of practice and opportunity come together.” I know that’s not right but you get the meaning that is intended. Sculptural paper artist Dawn Wohlford learned how to make paper at a workshop in New York City during the National Art Educator’s conference in 1983. Afterwards, she went back to Northeast Missouri State University and read everything she could find about the craft, experimenting as much as possible with improvised equipment. Then, with Bachelors degree in hand, she headed west to learn from the “man who wrote the book.” Upon arrival at Arizona State University, she discovered that Jules Heller (Papermaking) was on sabbatical that semester, so she would have to trust John Risseeuw to impart this wisdom. It turned out that Risseeuw was also a nationally known papermaker and he taught everything from the history of papermaking to how to make a perfect sheet of paper and so much more. After an intensive (and wet) semester in the paper lab, Dawn headed to Colorado where she became an apprentice to internationally known papermaker, Raymond Tomasso. There, she assisted in the production of paper for another famous artist, R.C. Gorman, and produced 150 sheets of nearly identical denim papers for a limited edition book, Strange Papers, that was assembled and bound in Germany. Once she had established residency in Colorado, she entered the graduate program at the University of Colorado in Boulder where she obtained an MFA in sculpture in 1988. In 1998, she moved back to her hometown in Iowa. She is currently the Visual Arts Director for Quad City Arts, Rock Island, Illinois where she oversees two art galleries and a public sculpture program. 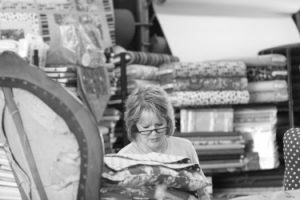 Additionally, she serves on the Acquisitions Committee for the Figge Art Museum in Davenport, Iowa, teaches workshops on papermaking, and creates sculptural pieces using handmade paper and found or recycled materials. I could be the Poster Child for the slogan “Reuse, Reduce, Recycle.” Handmade paper is the basis for the majority of my artwork, but I often incorporate, weave or build using other found materials. I use old clothes, dead plants, shredded money, and items such as used up doormats (made of natural fibers) to make paper pulp. I cast or incorporate pieces of rusty metal, vintage glass, bicycle inner tubes, leather and anything else that catches my eye. Pieces are often finished with pigment to achieve the appearance of metal. My approach to art making is methodical. Each piece is carefully planned and goes through several time intensive processes before reaching its final state. Each stage informs and alters the finished piece. The finished piece aspires to be both a beautiful object and a thought provoking or humorous reflection. Most recently, the plight of bees, as well as the construction of their hives (which is a form of papermaking) has captured my interest. Recent pieces reflect thoughts about the structure of beehives and how they are similar to human homes as not only a supposedly safe haven, but a place to work and create. Vero Rose Smith is a photographer, painter, and designer currently based in Iowa City, Iowa. Her recent work has focused on collective memory, the intersection of humanity and environment, and social justice. She is the Assistant Curator for the Legacies for Iowa Collections-Sharing Project at the University of Iowa Museum of Art. Artist Statement: An overt confluence of culture and military history has deeply affected both the Icelandic and American sense of identity. America is a country locked and loaded. America always wins. Iceland has never had a military of its own, though Icelanders do love their Coast Guard. To Iceland, international military presence and attention was a veritable bridge (rainbow or otherwise) into modernity. Previously an isolated fishing culture is known best for nearly-magical knitwear and Nordic ancestry, Iceland was catapulted to the forefront of communications technology during the Cold War. Improbably, the frigid, dreaming island entered a period of international importance and military strategery that has yet to end. Iceland is between, its twentieth-century political importance mirroring plate tectonics. So Iceland became the spoiled child of divorce, Russia and America attempting to win the country’s affections through increasingly expensive gifts. Both superpowers wooed Icelanders with film strips, each reel designed to subtly seduce. However, Americans showered the island with surveillance instruments, airplanes, and a new economy. And NATO (the new boyfriend) kept Russia at arm’s length. For Iceland, military involvement was passive and externally applied. Conversely, the American military complex is the embodiment of nationhood. Regardless, the history is partially shared. 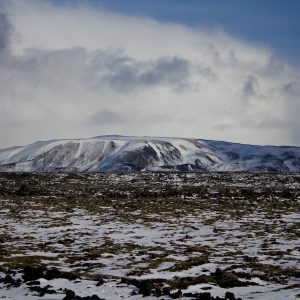 These photographs document the former (soon to be re-militarized) NATO base, located near Keflavík. “Mediated Moons” | A meditation on personal data and the feminine body. 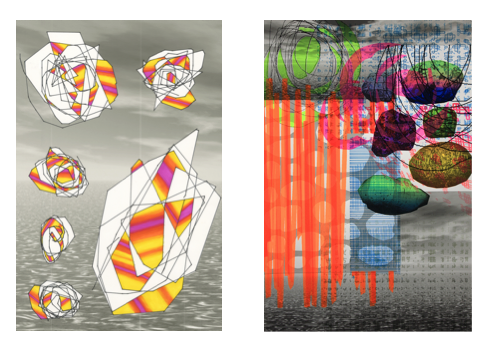 Artist Statement: In an age of easily quantified selfhood, what data points matter? What can (if any) combination of meticulously measured steps, heartbeats, breaths, posts, and tweets accurately reflect a fully human experience? Are these discrete values digitally gathered more valuable than bodily observations? Can a mobile device tell us something more important than the moon? Long a symbol connected to the divinity of fertility, the moon is a menstrual sentinel, a marker of time for both the earth and for the individual human observer. For the month of May 2016, I recorded my dreams. I then mapped my dream-remembrances onto the corresponding moon phase and created a series of stencils. Finally, I produced tonal paintings meant to emulate the emotional context of each dream and married these stenciled surfaces to mirrors. I am currently working on a web-based application to allow users to create their own moon-dream stencils in real time. Tara Moorman was raised in a family of fine craftsmen and women who were always building something. She embraces their creative and artistic traditions. Inspired by old family photographs and a desire to bring her ancestors to life, the photos became an opening that allowed her to merge art with love of family, history, ancestry and storytelling. Her ancestors beckon her to keep working and sharing her creativity with the world. Tara’s work “Letters to my Ancestors”, her summer 2017 solo show at the Cedar Rapids Museum of Art (CRMA) was widely received. Tara’s artwork and intuitive writings from the show were published by the CRMA. 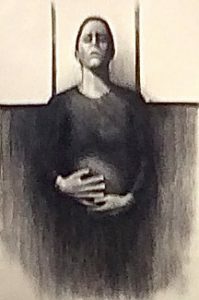 She has exhibited at numerous juried exhibitions at the CRMA, Black Earth Gallery, Polk County Heritage Museum, Davis Art Center, Ft Myers, FL, The Albuquerque Museum of Art and the Sedona Art Center. Her work is found in many public and private collections, including the United Way of East Central Iowa, The American Cancer Society, Hope Lodge at the University of Iowa Hospitals, St Luks Hospital, and the Kansas City University of Medicine and Biosciences. Tara was born in Newton, Kansas. She has a Bachelor of Fine Arts from the University of Kansas, Lawrence, Kansas. She lives and works in Cedar Rapids, Iowa. A box of old family photographs from the 1800’s – 1960’s, inherited from my mother and grandmother, are the impetus for my work. Inspired to bring these ancestors to life, the photos became an invitation to merge my art, love of family, history, ancestry and storytelling. Painting their spiritual light with an aura of rainbow colors, creates an etheric atmosphere, while showcasing their period clothes, beautifully patterned dresses, boots, hats and cars lends a contemporary feel to the portraits. Meet my maternal grandmother, Anna Stubblefield Nation, follow her life as a young girl, living on a farm, through her marriage to her childhood sweetheart, Charlie Nation, up until her last days. If you see your family in mine, please join me, reconnecting and honoring those who came before. Carlene Dingman Atwater was raised on a farm outside of West Point, Iowa; she’s drawn pictures of horses since she was old enough to hold a pencil. Watercolor was her first medium of choice when she saw a Wendell Mohr watercolor. 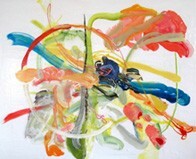 The richness of colors and the transparency of the medium inspired Carlene to pursue watercolor. This evolved to include pastel and oil painting. 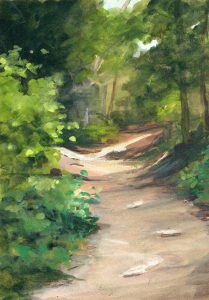 Carlene’s introduction to plein air was 25 years ago when the local art center asked her to paint at their garden tour. A lover of the great outdoors this was a perfect fit. She could be seen at the local parks, on the banks of the river or anyplace she could find a nice view. In 2011 Carlene started a blog, in order to join the daily painters’ movement. Her goal was to post a new, small, oil painting every day for a year. She ended up with over 200 (mostly 6×6) paintings the first year. Along the way she discovered that the discipline of painting (mostly) every day improved technique and pushed her to try new subjects. Carlene started her “52 Faces of Volunteerism”. with the goal of painting oil portraits from life, once a week, for a year. She started from life for a two hour session, then, because of the volunteers’ busy lives, she finished the portrait from photos. The end exhibit was a tribute to the local non-profits and the volunteers that keep them going. As a youngster, I was always drawing and painting. Life became fuller and gave way to other creative outlets in the forms of teaching and problem solving, studying more, travelling…and so I have come full circle. When I retired, now five years ago, with a bit more time to devote, I picked up my brushes again. I’m drawn to settings with water because I love the reflections and refractions. I prefer more abstract renditions, however, sometimes my paintings turn out rather realistic. I favor working with oils or watercolors. Jessica is a graduate from Western Illinois University. She paints in oil, watercolour and pastel. She recently took up plein air painting and spends the majority of her time outdoors painting and participating in competitions. 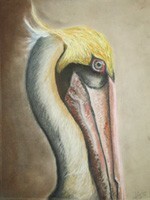 John is an artist working primarily in pastel and colored pencil. He is a retired art teacher who spent 38.5 years in the classroom. A graduate of the University of Northern Iowa with a bachelors degree in art education, John began his teaching career at Lynnville-Sully where he taught K-12 art for 19.5 years. He joined the staff at Pekin in 1992 where he taught Middle School Art, High School Art, Photography, Computer Graphics and was the yearbook adviser. John retired from education in the Spring of 2010 after a 39.5 years in teaching. During his time in education he maintained a studio in his home where he continued to develop a personal style in a variety of media. He is a charter member of the Iowa Pastel Society. A signature member of the Iowa Pastel Society. President Iowa Pastel Society. I am a landscape painter. My subject matter is very traditional and my painting style floats between realism and impressionism. The Impressionists and Post Impressionists have greatly influenced me.If I could put my finger on why I paint, what I paint, where and how I paint, it is to simply search out special places and explore the emotional moments with all senses on high alert throughout the entire process of creating art. It intrigues me how light elevates a commonplace landscape to an extraordinary one. I strive for my paintings to be lyrical accounts of that unique fleeting moment in time. My intent is simply to convey an emotional and intuitive response to the mystery and serenity of the landscape in light and shadow. Hopefully, I compel the viewers to interpret my work from their own rich pool of memories, impressions, and experiences and in a little different way each time they encounter it. I found pastel to be a wonderful link between painting and drawing. The pastels’ ability to maintain the integrity of individual strokes, combined with the liveliness of its colors, foster a passionate poetic language of marks. If I can give the viewer an impression of atmosphere, if I can open their eyes to the simple beauty around us, then I have done well. Work in many private collections. Creating visually is something I’ve done all my life. I loved coloring in colorbooks when very young then doodling whenever my hands felt idle while growing up. 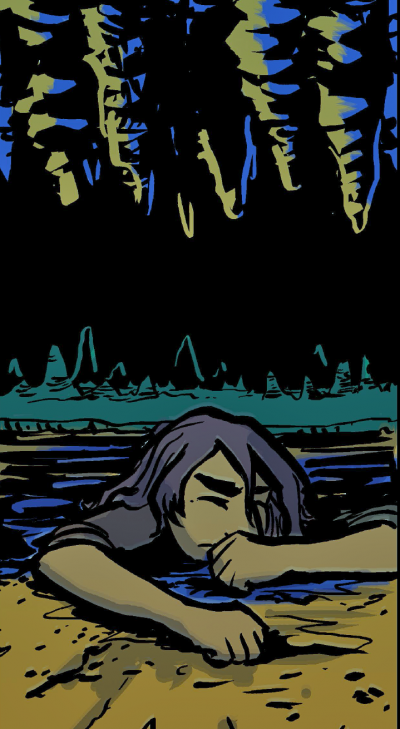 Now the problem-solving process of mixing color, simplifying what I see before me, and translating the beauty that surrounds me is all I desire to do. After training at Iowa State University (BS) and exploring at the University of Tennessee (MS), I formed the foundation of my personal approach to communicating visually. Through the experiences, I discovered my decision-making process of DESIGN. The image destination becomes the structure of design. Each new media is a road or path to each the visual journey’s end. 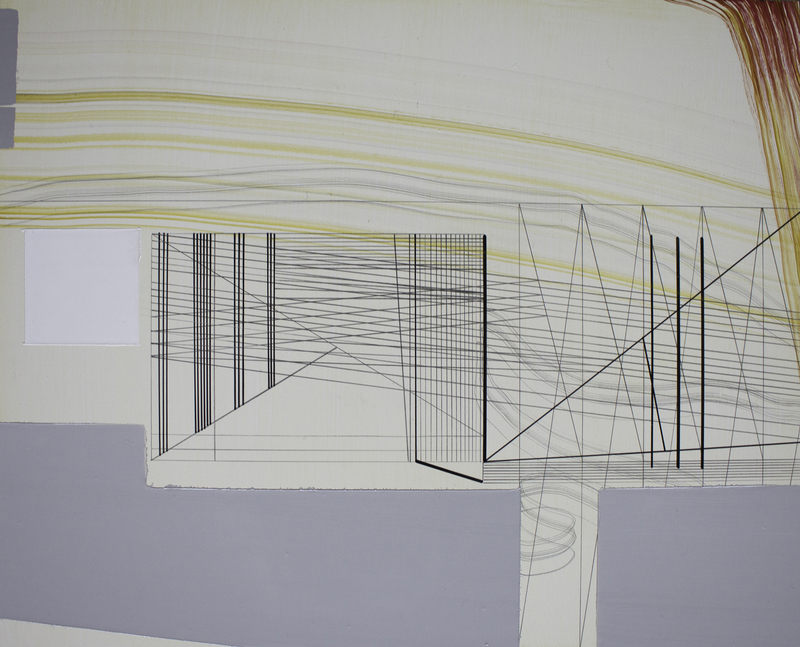 Reality and abstract pieces become decision-making exercises in the structure of design. My art starts with an idea, a thought, a feeling, or a location. The media is the last decision selected before a mark is made on the surface. Kali is the embodiment of time and the goddess of death and rebirth in Hindu theology. A terrifying manifestation of cosmic energy, Kali is sometimes regarded as the personification of divine destruction, and at other times considered a constant creator. 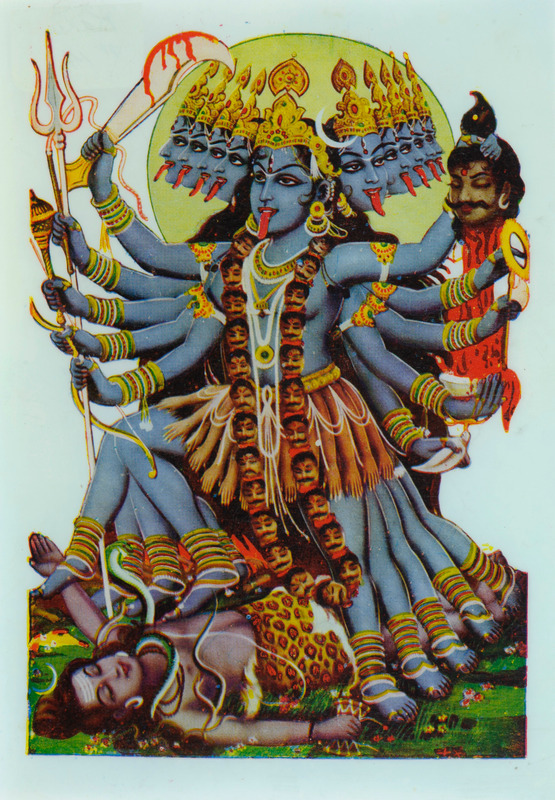 Identifiable by her luminously dark blue or black skin and her exposed tongue dripping with blood, Kali is often depicted garlanded in skulls and clothed in a skirt composed of severed hands. Though formidable to behold, Kali is also the destroyer of fear. To contemplate images of Kali is to encounter the inevitability of death, and to find peace in the ceaseless cycle of life. This small selection of works from the Indian folk art collection of Georgana Falb Foster illustrates the continual rebirth of images of the goddess herself. For centuries, inexpensive artworks representing Devi (female goddesses) were produced and distributed throughout India and Southeast Asia. Advancements in printmaking technologies such as the introduction of lithography in the late nineteenth century precipitated the production of increasingly colorful and visually dense devotional objects. Printmaking workshops such as the Calcutta Art Studio paired detailed images with prayerful texts. The phrase “brilliant as a dark cloud” is a snippet of one such prayer dedicated to Kali, often included in early poster designs. Iconography and printmaking techniques continued to evolve over the subsequent century, resulting in the posters included in this exhibition. Collected in the 1980s, these mass-produced posters and calendars offer a snapshot of daily devotion and secular visual culture in India during the late twentieth century. 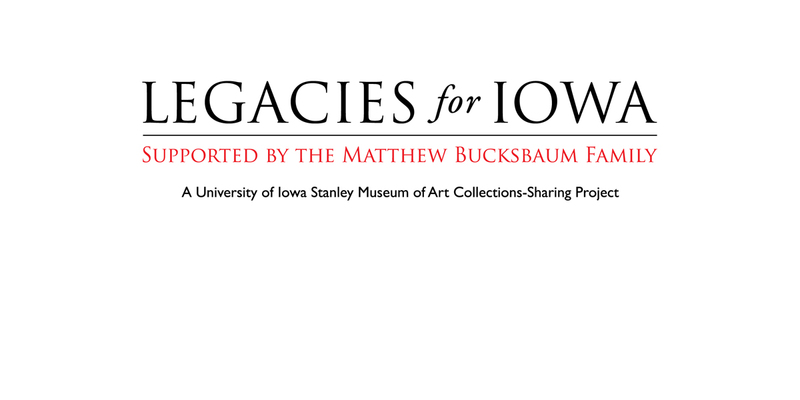 This exhibition is curated by Vero Rose Smith and organized by Legacies for Iowa. My years of technical art illustration, graphic art, photography, and engineering drafting experience are the foundations of my art. The approach that I have for drawing, etching, and painting is via my technical background. 1. We are not here to do what has already been done. 2. The artist is the person who leaves the crowd and goes pioneering. 3. All any artist can hope to do is add his fragment to the whole. 4. The artist who has great emotion might burst into tears-but that is far as he will get if he has no practical side. The artist must have the emotional side first, the primal cause of his being an artist, but he must also have an excellent mind, which he must command and use as a tool for the expression of his emotions. 5. No matter how good an artist’s education is his education is in his own hands. All education must be self-education. 6. Few artists will ever mention that they have studied under themselves. 7. We must realize that artists are not in competition with each other. 8. You can learn much from others, but more from yourself. 9. Try to reduce everything you see to the utmost simplicity. 10. A work of art is the result of the effect of the model on the artist. It is not the model we need, but the vision. 11. Works of art are created, not to satisfy the viewer, but the creator. As I read, draw, etch, and paint, I try to apply the techniques of suggestion rather than showing. Most of my art looks super detailed, but take a closer look. You will find that many details are loosely painted or drawn. I like to call my artistic style as being: Abstract Realism. 3. 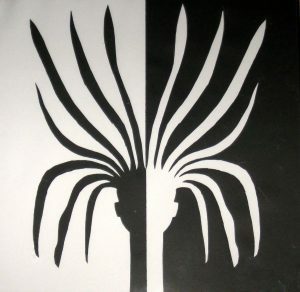 Travelled (1990 – present) to 48 of the 50 USA states and internationally to 20 countries. Visited dozens of history museums, cathedrals, churches, art museums, art studios, art galleries, parks, commercial manufactures of artistic objects, theater performances, orchestra concerts, ballets, artists, etc. Some of the countries are China, Thailand, Netherlands, Russia, Norway, Italy, Germany, Austria, and others. 4. Christmas, I have created an original drawing or etching for the cover of my personal Christmas card for each of the past 47 years. 5. Library, My personal library contains 1,100 art books out of 2,500 total. 6. Fine Artist, created fine art ink drawings, etchings, engravings, woodcuts, prints, landscape paintings, portraits, custom welded jewelry, and metal sculptures from 1967 and on. Many works have won awards. November 8th at 6 pm Artists in the University of Iowa’s Stanley Museum Collections – Vero Smith (Associate Curator, Legacies for Iowa Collections-Sharing Project) | A magnet for the visual and literary arts, the University of Iowa attracted many notable creatives to the state over the past century. This lecture will trace the geographic and aesthetic journeys of several notable artists: Byron Burford, Mauricio Lasansky, Elizabeth Catlett.